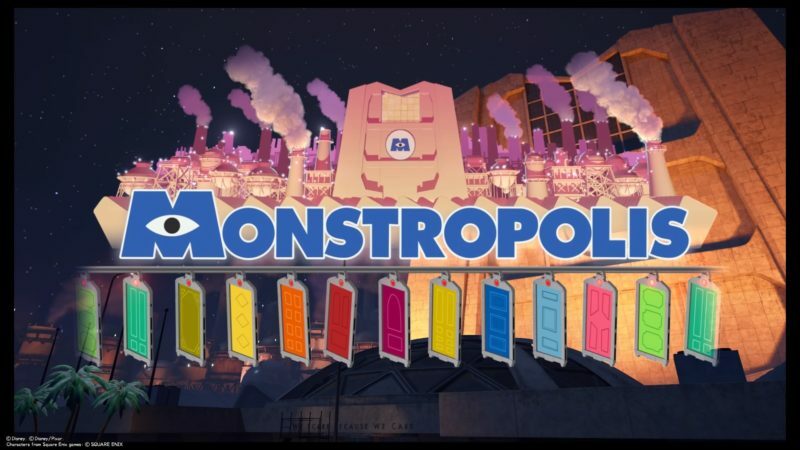 Monstropolis is the 5th world you’ll probably visit in Kingdom Hearts 3. 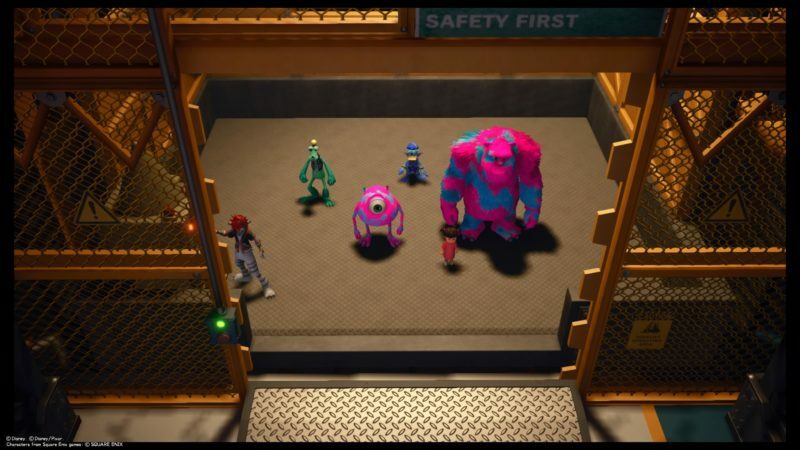 As the name suggests, it has everything to do with the Disney film Monsters Inc.
Here’s a walkthrough and guide of Monstropolis in KH3. 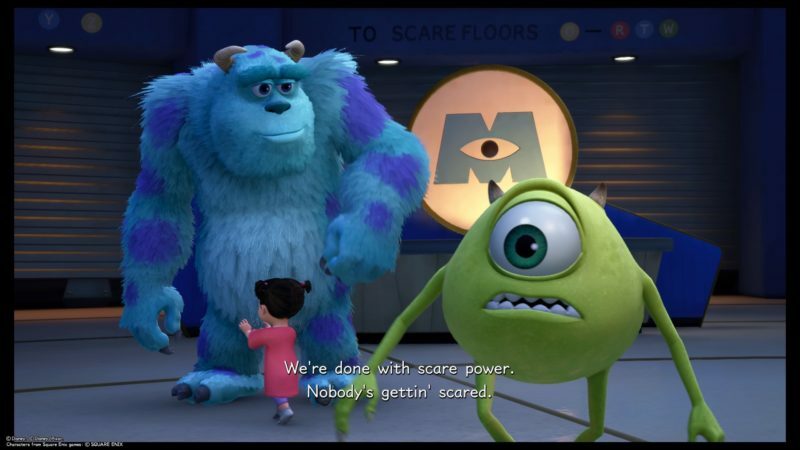 The story begins with Sulley and Mike playing with Boo. 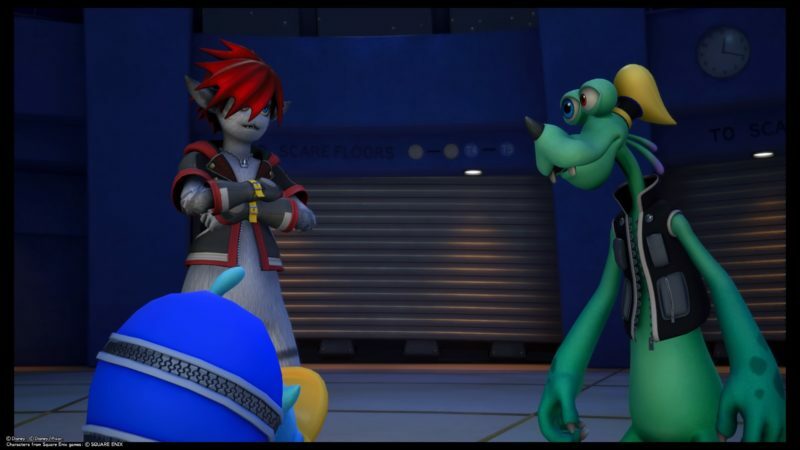 Sora, Goofy and Donald then shows up and meets with them. 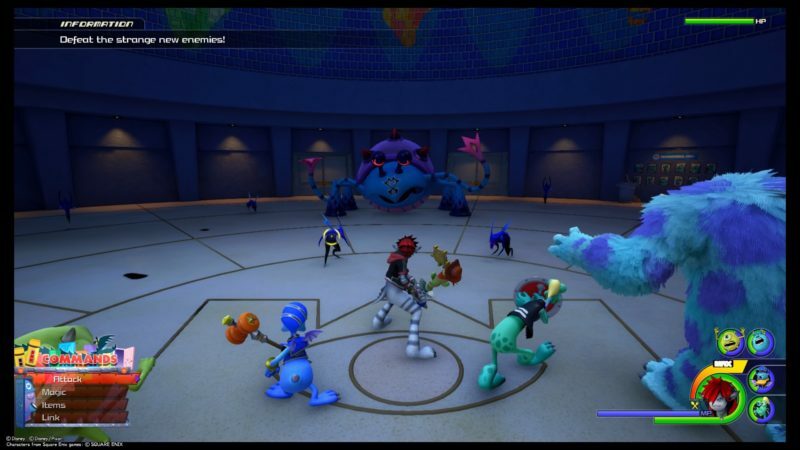 Just as expected, you will start off the game with a fight. 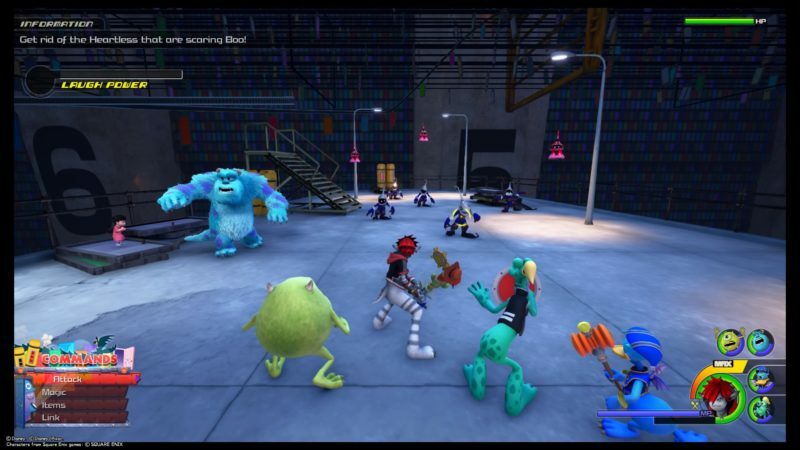 This time, you’ll be faced with the Unversed, which is different from the Heartless and the Nobodies. Apparently they are formed based on negative emotions. 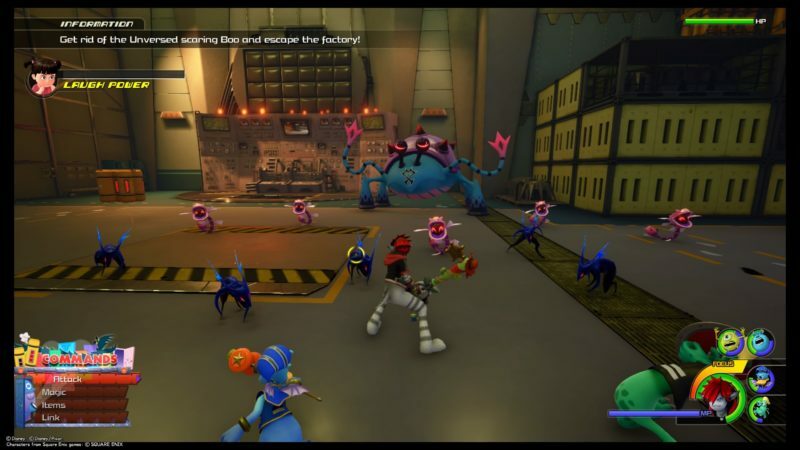 Defeat them and the cutscene shows up again. 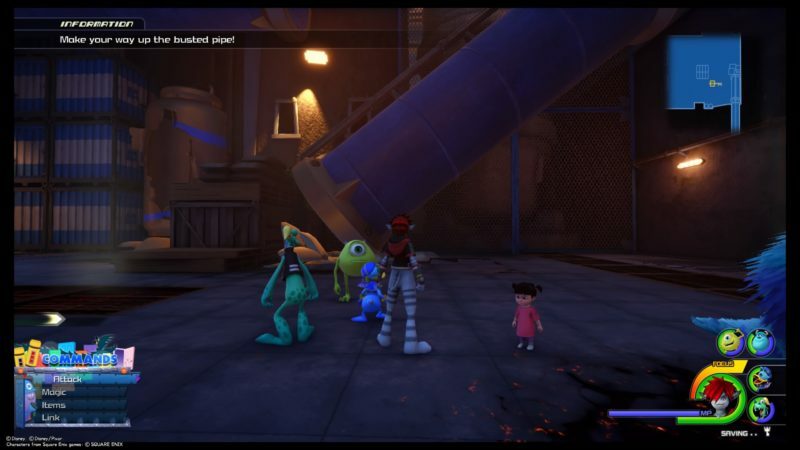 Sora and the rest will be transformed to look like monsters in this world. 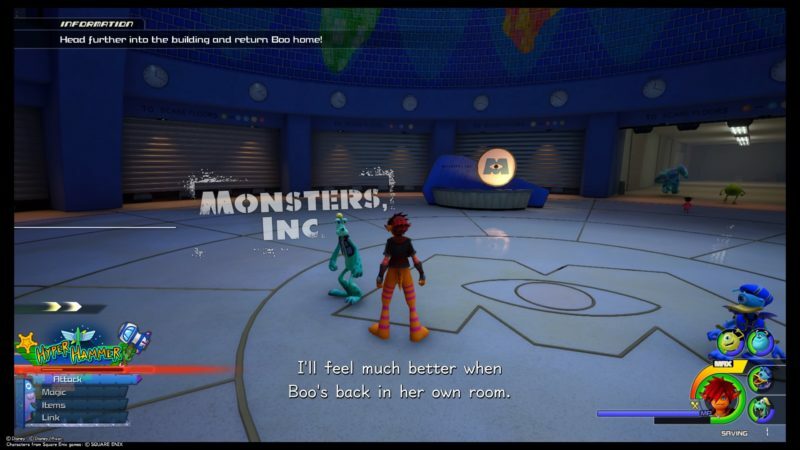 Your main objective of this world is to bring Boo back, but there are plenty of obstacles on the way. Now, get into the building. You should find a treasure chest nearby. 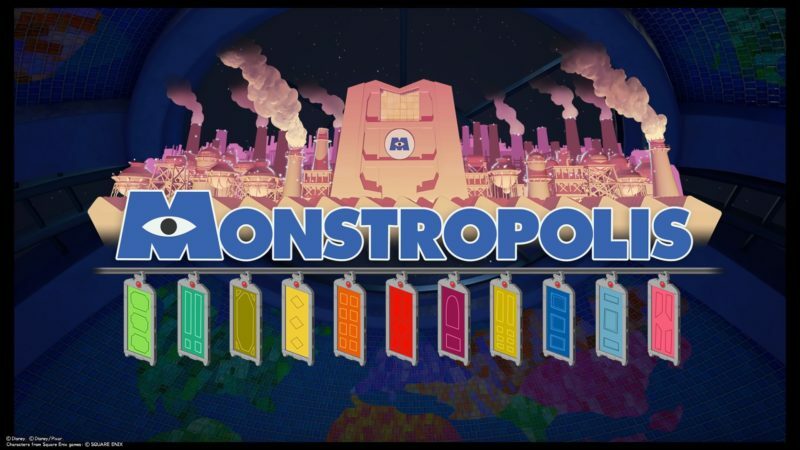 It gives you the map of Monsters. 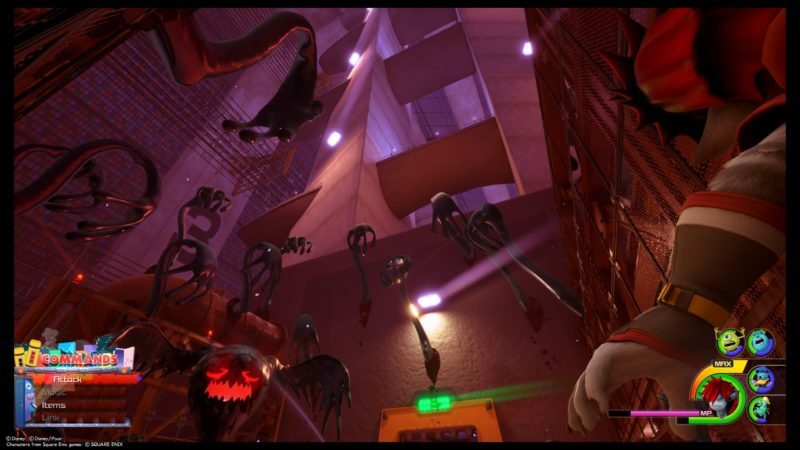 Inc.
More Unversed will spawn inside the building. Get rid of them. 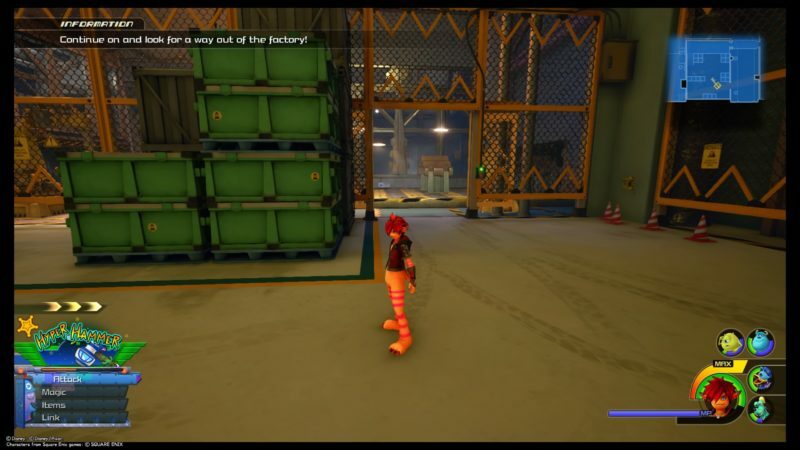 Keep going further until a cutscene loads. You will then reach the Laughter Room (used to be known as the Scare Room). There will be more Unversed here. Kill all of them. Also, there will be two lucky emblems here. Do look for it (one on a desk, another under a figurine). 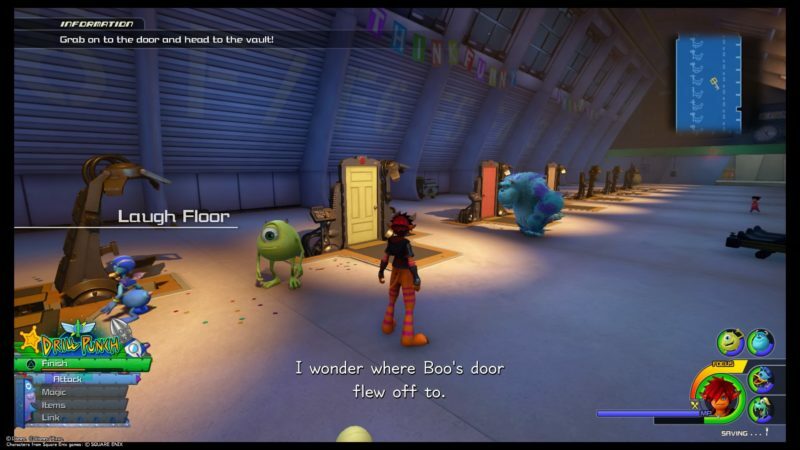 The next thing you have to do is to find Boo’s door since it went away. Now, you have to grab unto one of the doors. 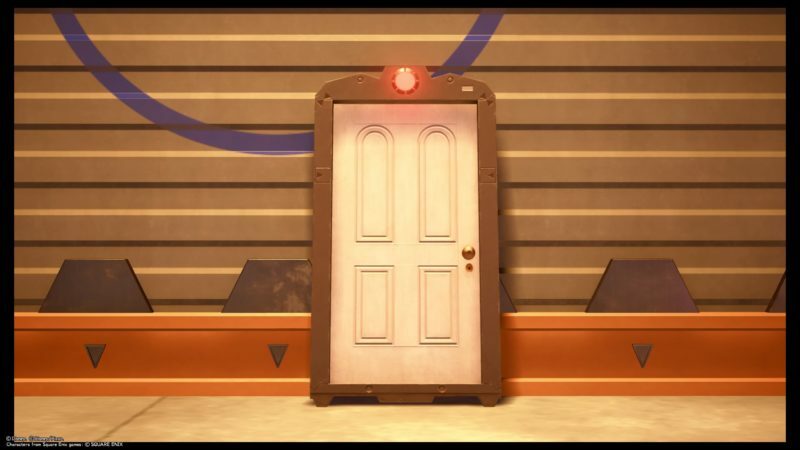 Use this door (image below). 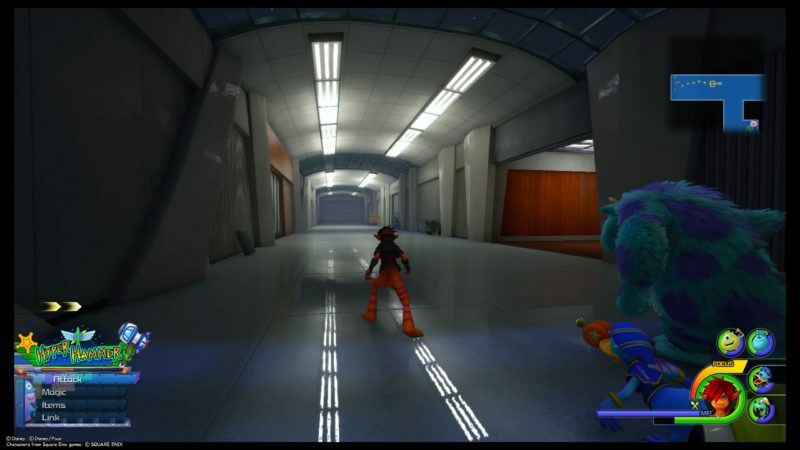 You will be transported to another area of the building. 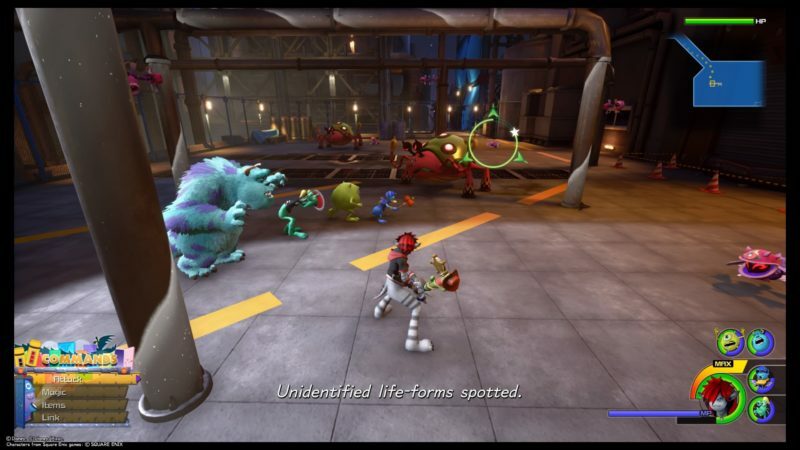 Apart from the Unversed, you can also find Heartless here. 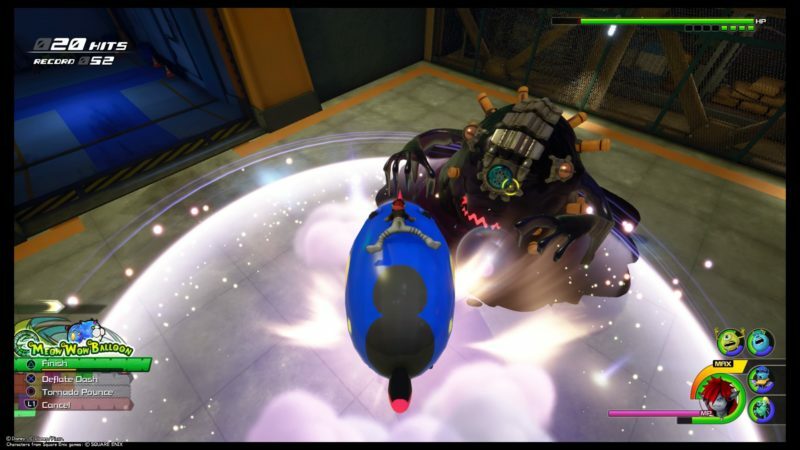 While sliding, you need to destroy the Heartless. There are also parts where you need to take cover due to some electricity outbursts. 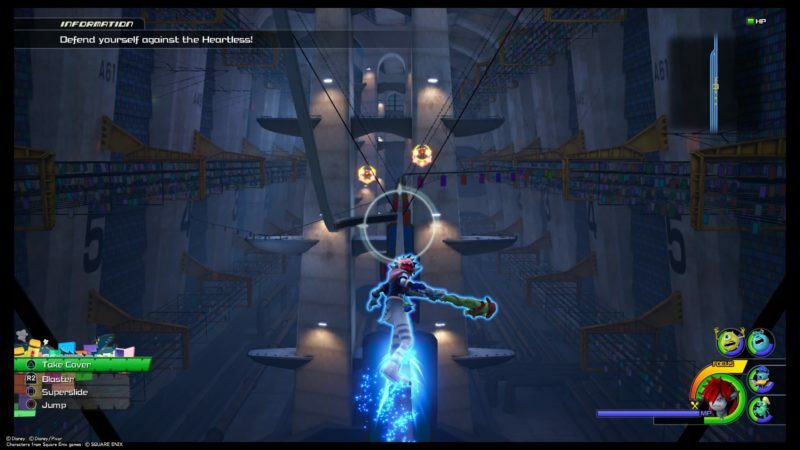 After reaching the platform, you will meet more Heartless. 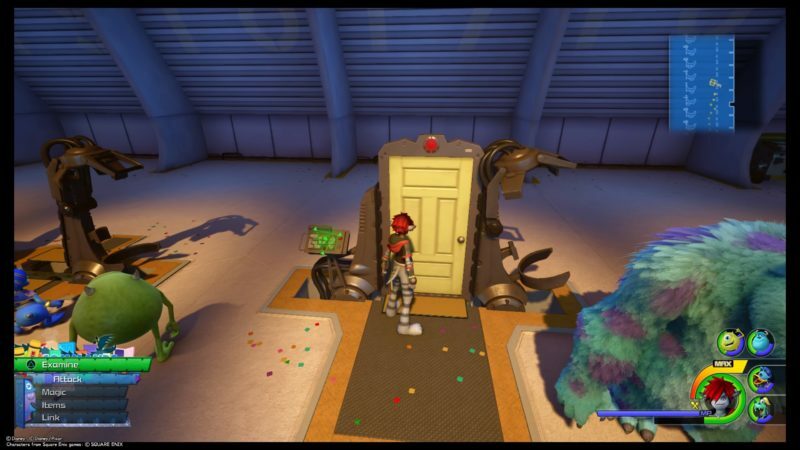 Also, the door doesn’t seem to be working and requires more power. 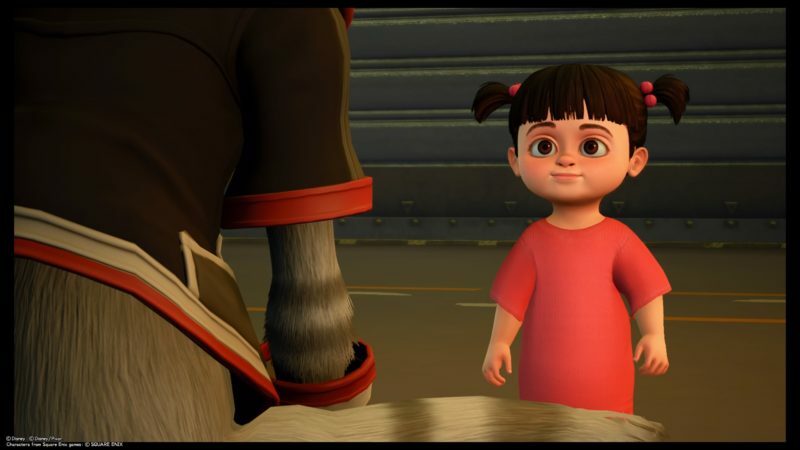 Laughter seems to power up this world, and the aim here is to get Boo’s laughter power to the max. 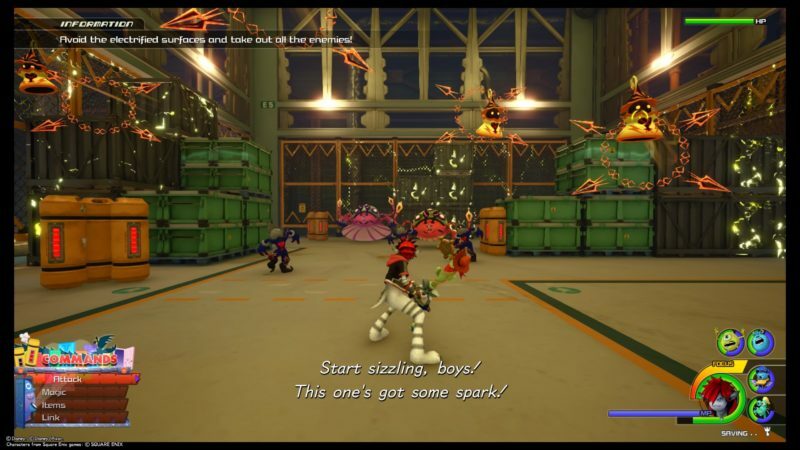 To do so, just keep defeating the Heartless that spawns until the bar is full. They will keep spawning until you fill up the bar. Once the bar is full, you will get a prompt to use the scream power. Press “Triangle” and the scream attack is activated. 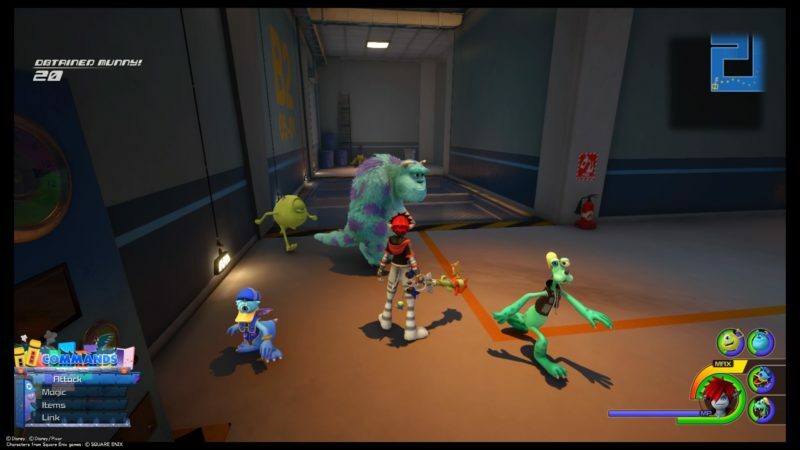 Sora, Goofy, Donald, Sulley and Mike will use the skill together. It’s a unique team skill for this world. 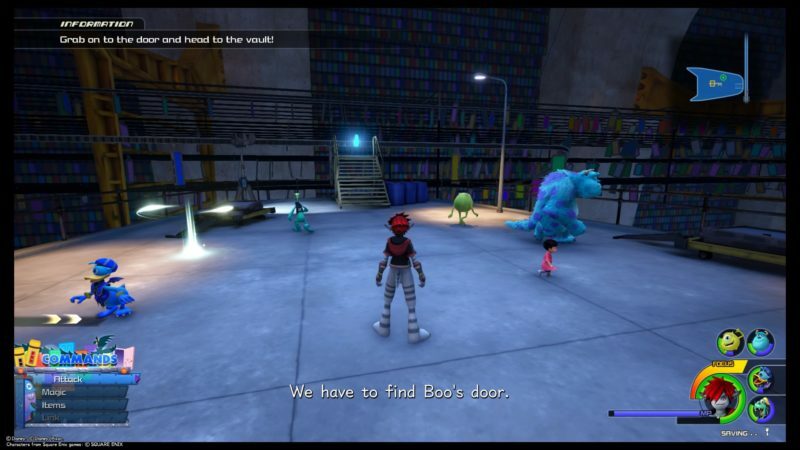 You have to find Boo’s door and it’s probably in the vault. Now, grab onto the door and proceed. Climb up the stairs to do so. 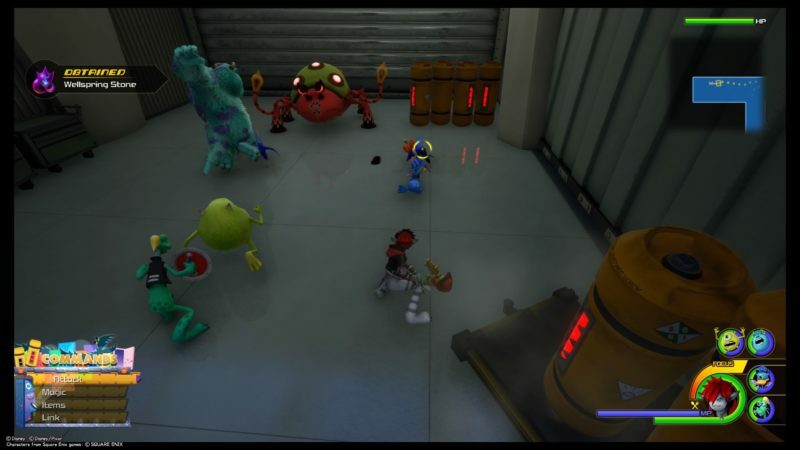 You will then have to slide again and defeat the Heartless that spawns on the way. Take cover when you see this electrical outburst (image below). You will then reach another platform. 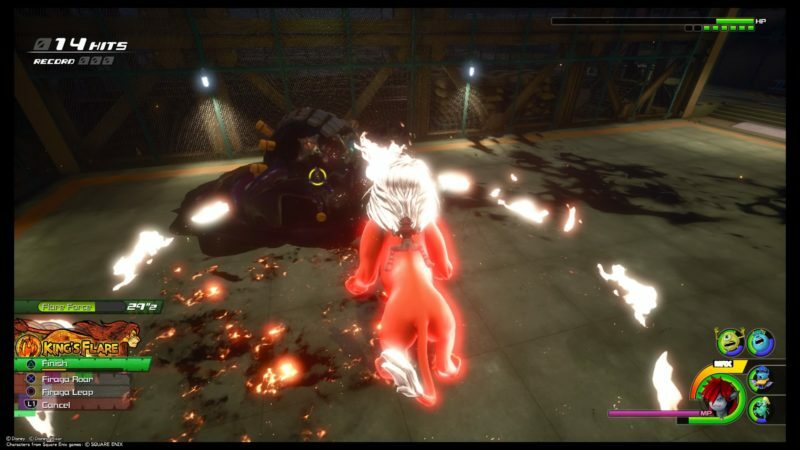 More enemies will spawn. After defeating them, get to the door if you wish to proceed. 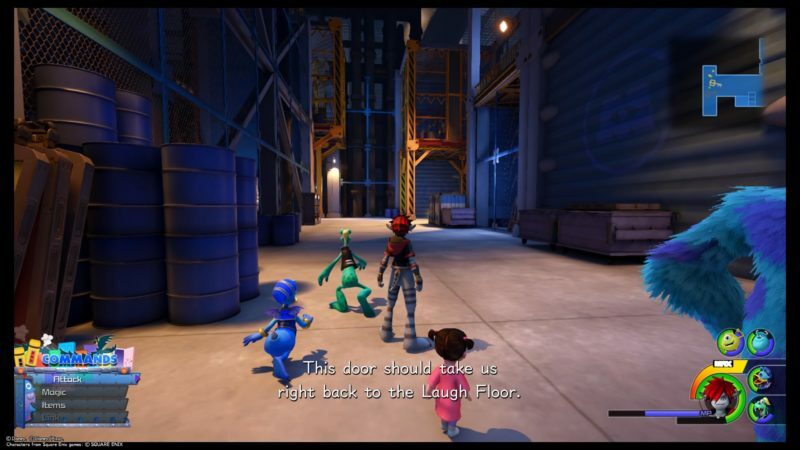 You guys will then reach an area filled with doors. 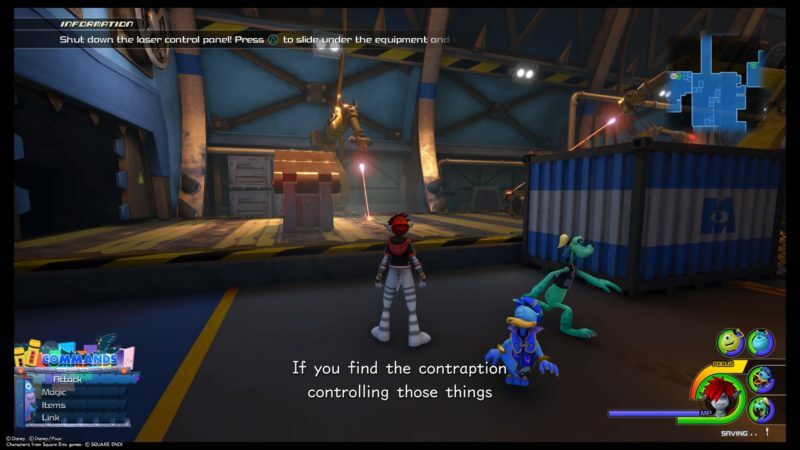 Keep going until a cutscene loads. All of you guys will enter this white door. 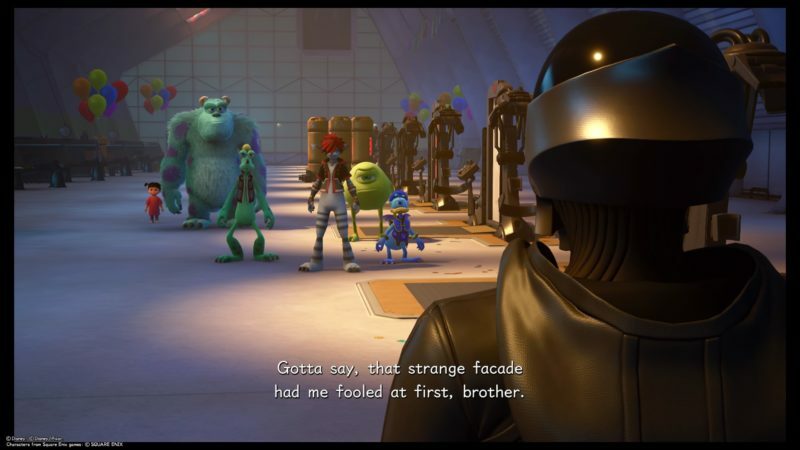 Randall (the villain in Monsters Inc) shows up and enters the door as well. He then appears, aiming to get rid of you guys. Apparently, he has a secret weapon (powered by the Organization) but it didn’t work. 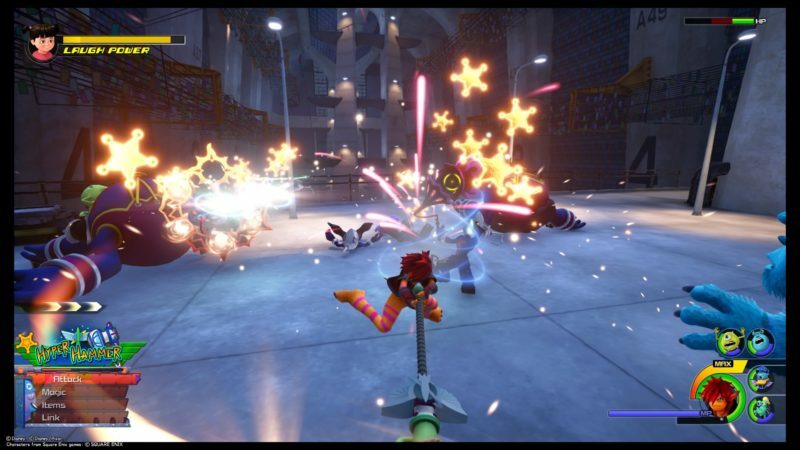 Only after Sora and the rest left, Vanitas appeared and power up the weapon. You will deal with it later as a final boss. 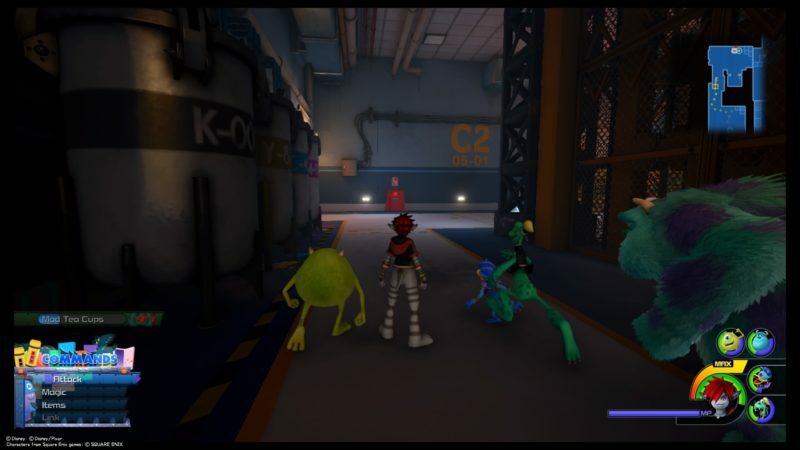 Sora and the rest will reach the factory area. 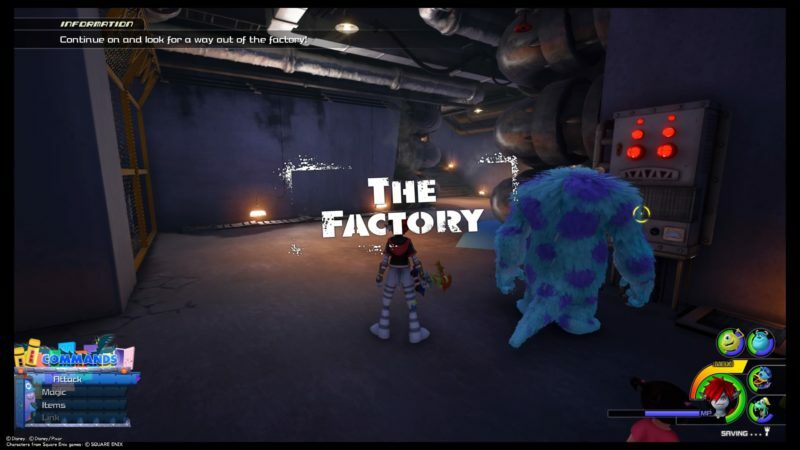 There should be a treasure chest nearby that gives you the map to the factory. 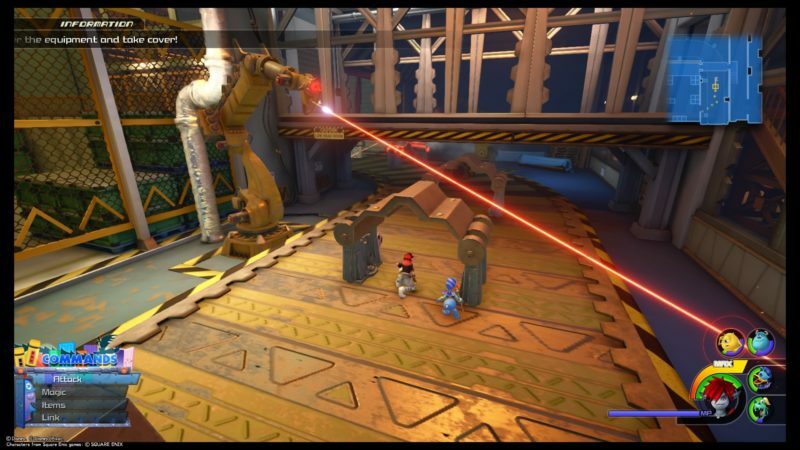 After walking for some time, you will reach an area where the laser machines have lost control. 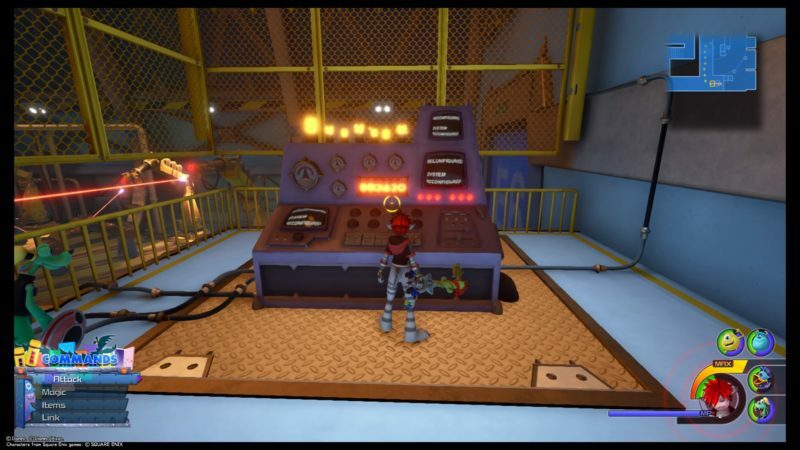 You will have to get to the end of the conveyor belt to find the control panel and destroy it. 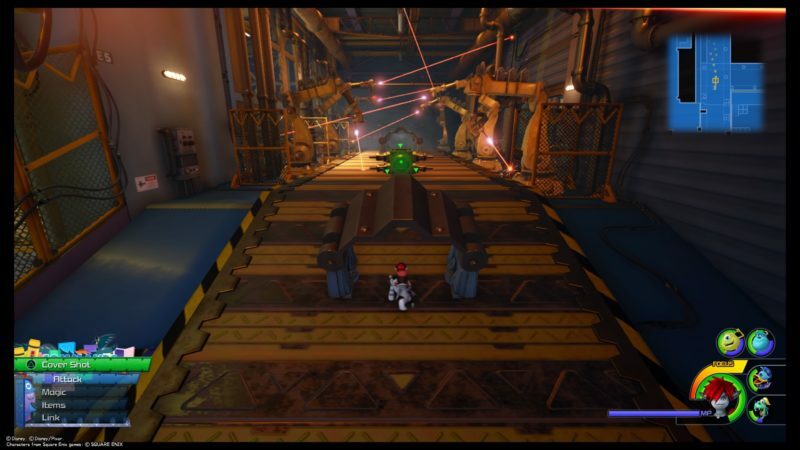 To avoid the lasers, try hiding under these steel things. They can be destroyed by the laser after time, so you have to get to the next one. Keep going until you find the control panel. Just hit it until it gets destroyed. 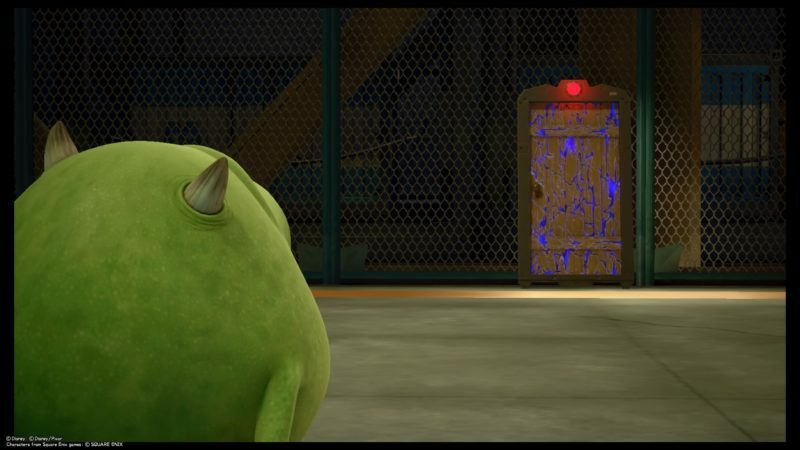 Once the laser stops, Sulley, Mike and Boo will join you guys again. There’ll be more Unversed to deal with here. 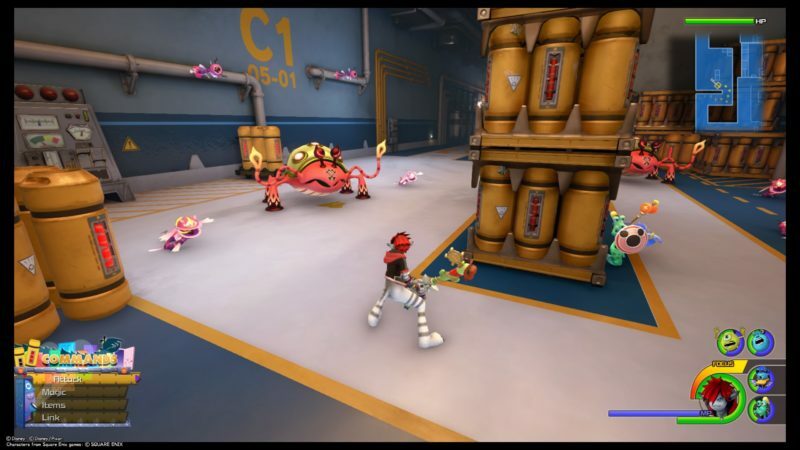 You will now reach an area with paint spills. One of the spillage is a lucky emblem. I’ll have another post just on lucky emblems itself, so don’t worry about it. 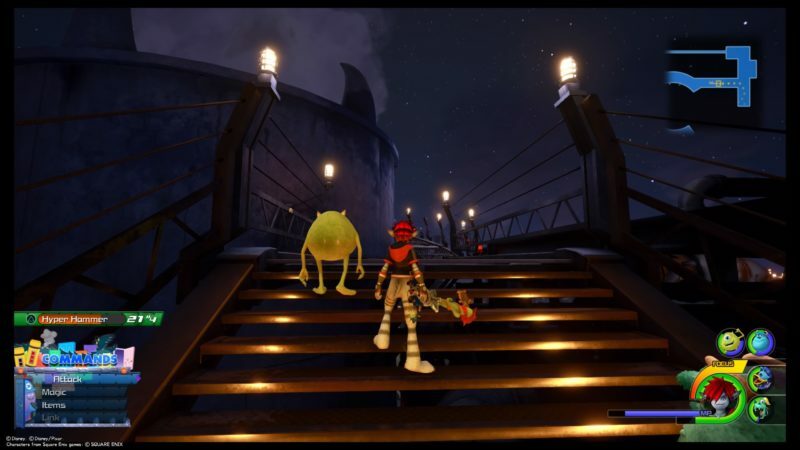 Sulley and Mike decided to paint themselves to get to the next area. There’ll be an elevator. Get to the next floor. There’ll be more enemies here on the second floor. Once you’re done, keep walking ahead. 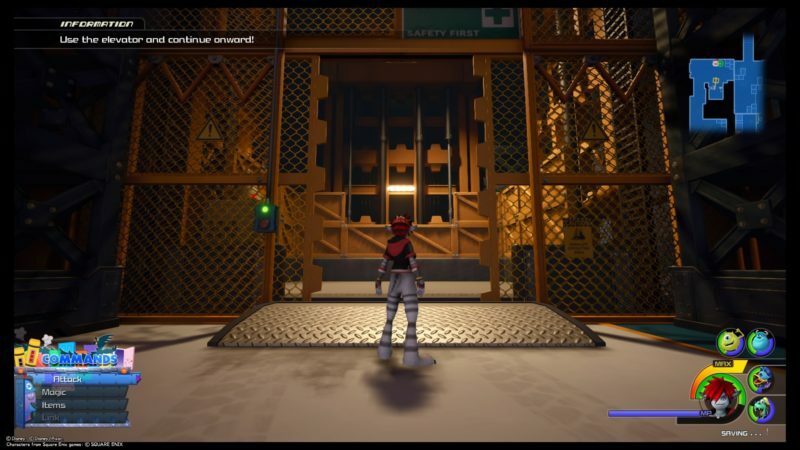 Keep going until you reach this area. 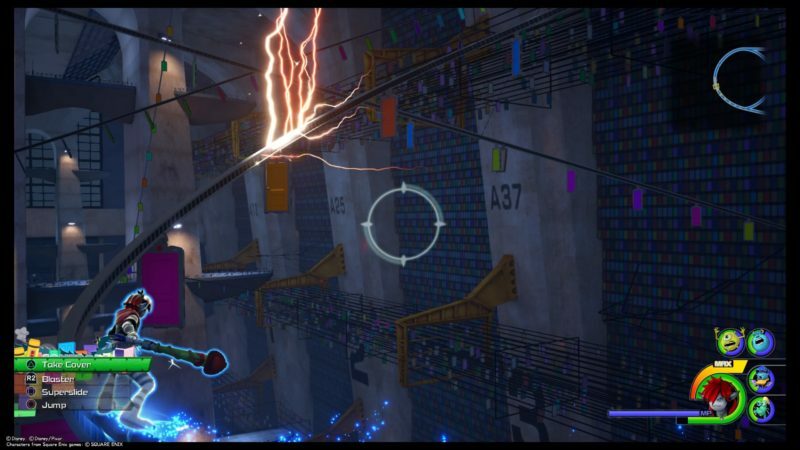 The sides are all electrified, so you may want to avoid getting zapped. 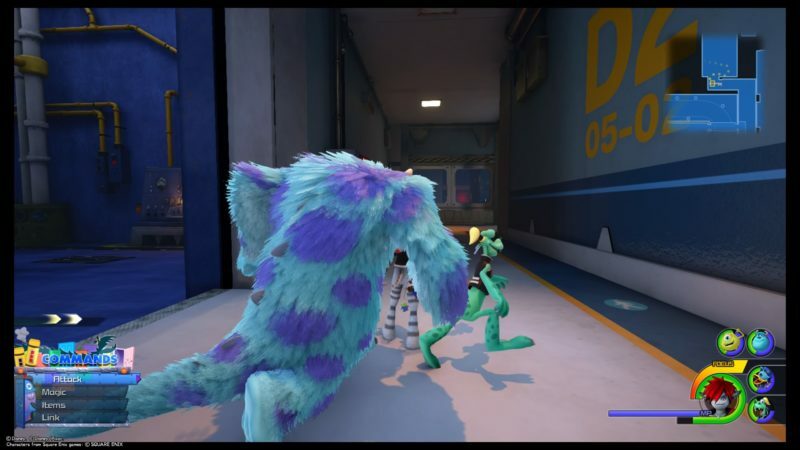 Defeat the enemies inside and you’ll be free once they’re gone. Keep looking for a way to get out of this place. 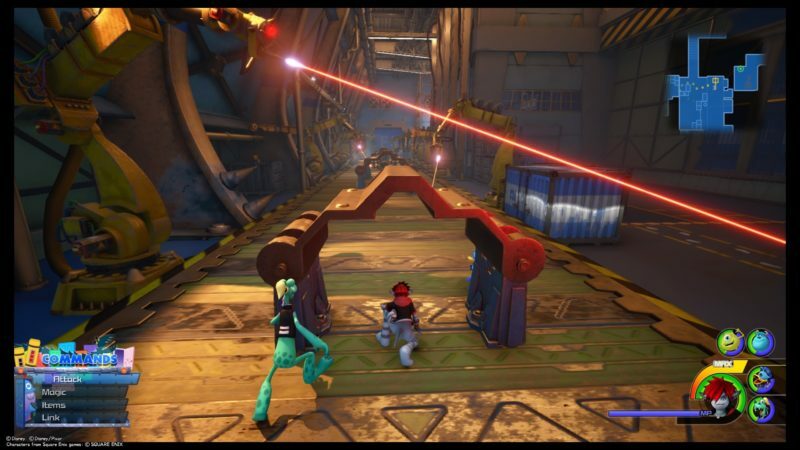 Once again, you will meet these malfunctioning laser machines. 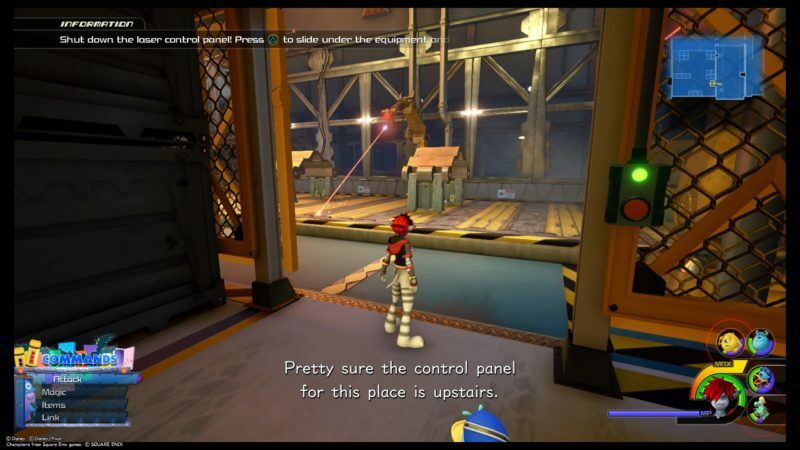 You have to get to the conveyor belt and get to the control panel upstairs. Use the equipment to take cover temporarily. The conveyor belt leads to the upper floor. Keep doing the same thing and avoid getting killed. 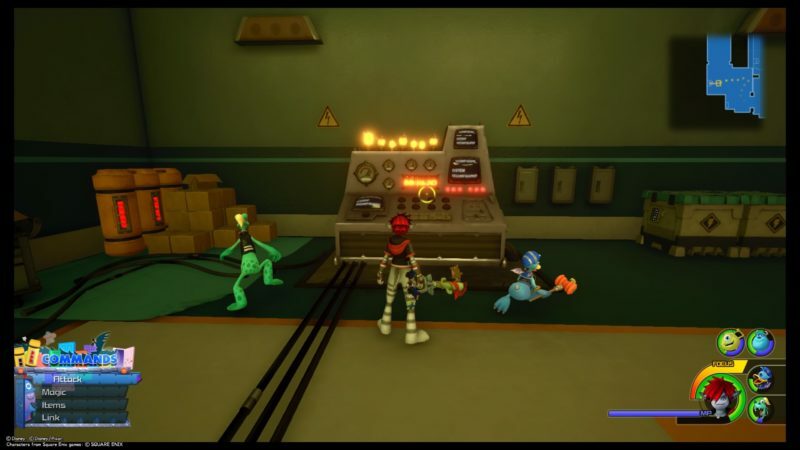 You should find this control panel at the end. Destroy it and the rest will join you again. You will meet more Unversed here. Destroy all of them and at the same time, you will increase Boo’s laugh power. There’s a catch this time. 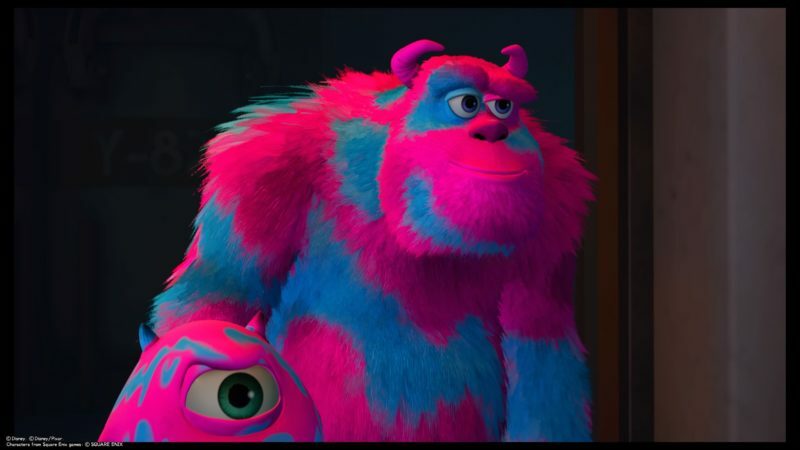 If Sulley gets attacked, Boo will get scared, which affects the laugh power. 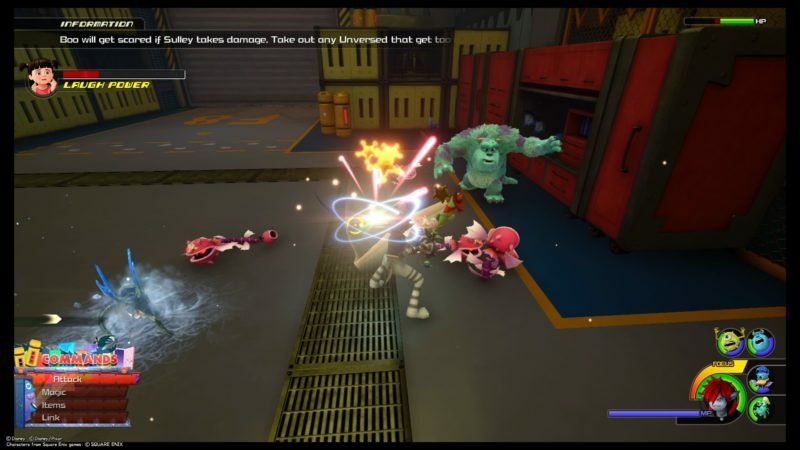 Try not to let Sulley get any damage from the Unversed. 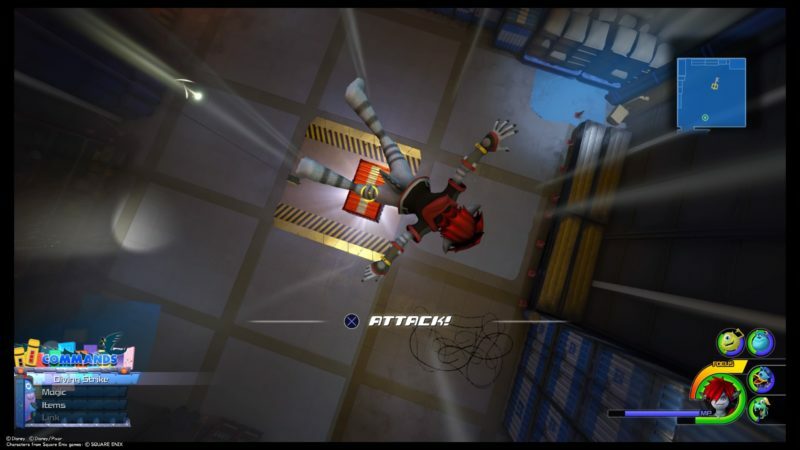 Once you’re done, a cutscene appears. 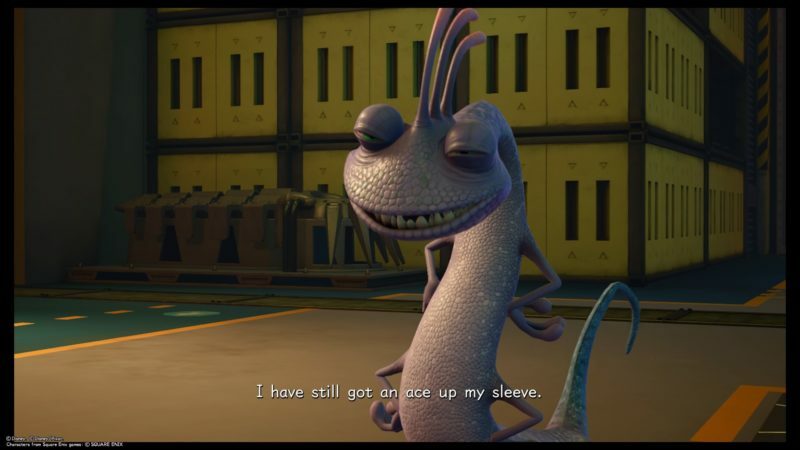 Randall shows up again, and this time he’s confident that his secret weapon works. He will leave once again after taunting you guys. 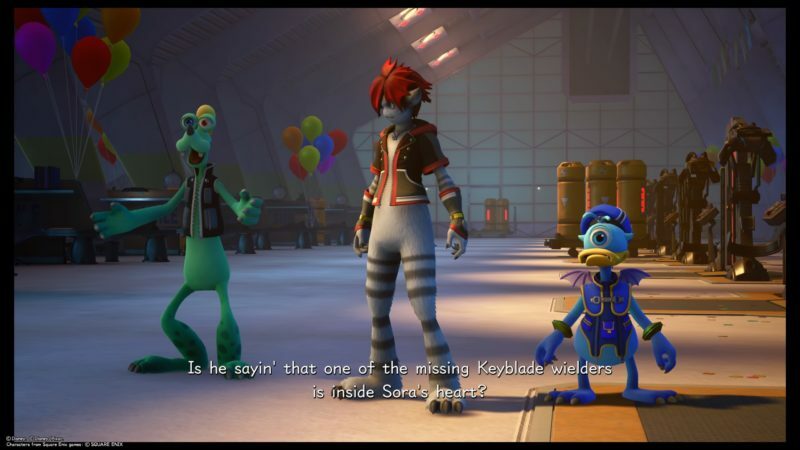 After the cutscene, you will get a Laughter Pin. 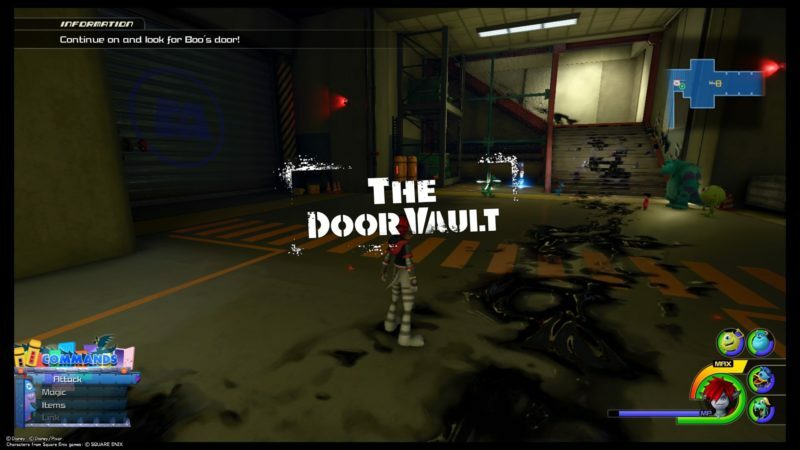 The aim now is to get to the door vault. 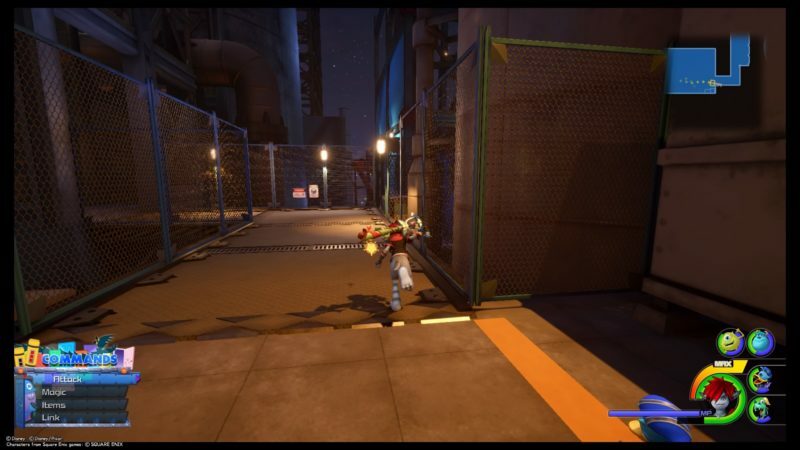 You will reach the Power Plant first. Go through this long walkway. There’ll be enemies along the way. After the walkway, you’ll finally reach the outdoor area. 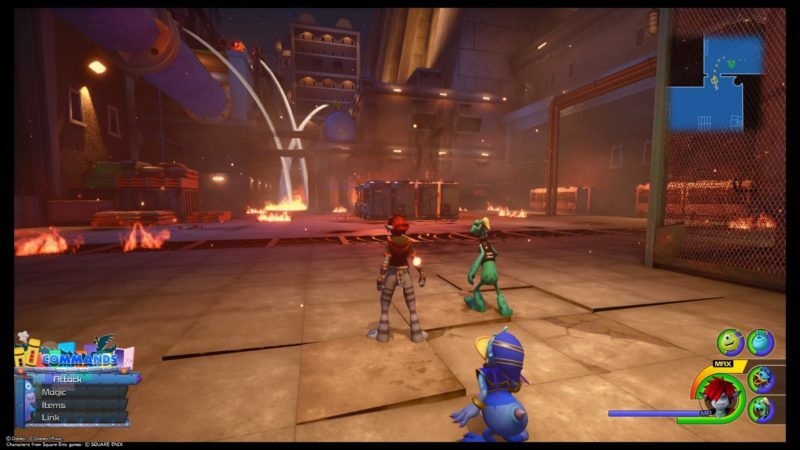 You’ll see plenty of flames all over the building with Unversed roaming around. Now, take out all of the Unversed. The place is burning, so try to keep out of the flames. You will get hurt otherwise. 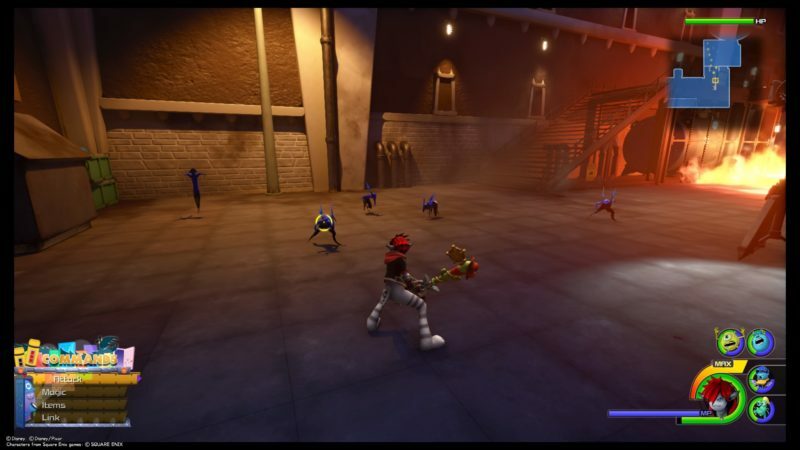 Once you’ve beaten them, the CDA appears in the cutscene and puts out the fire. 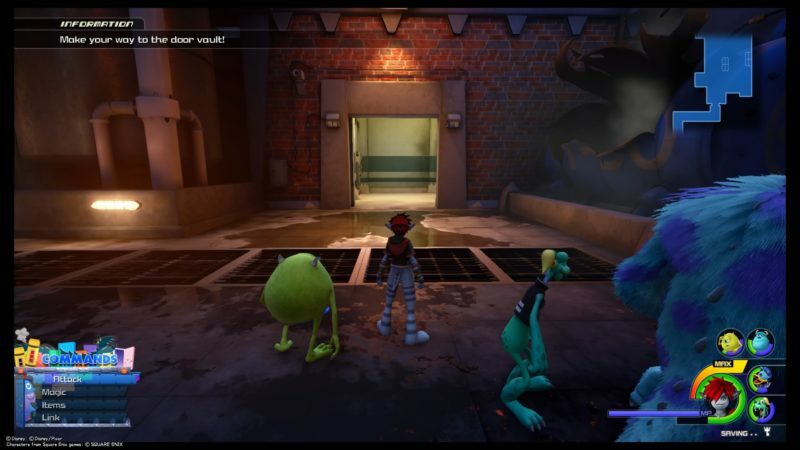 Continue your journey to the door vault. 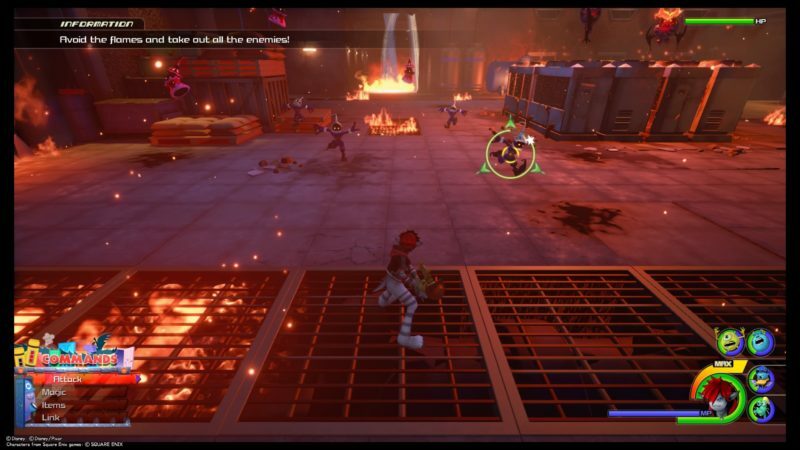 Keep going ahead using the map, and defeating all of the enemies that spawn. At one point, you have to go up. Slide above the pipes to the next destination. 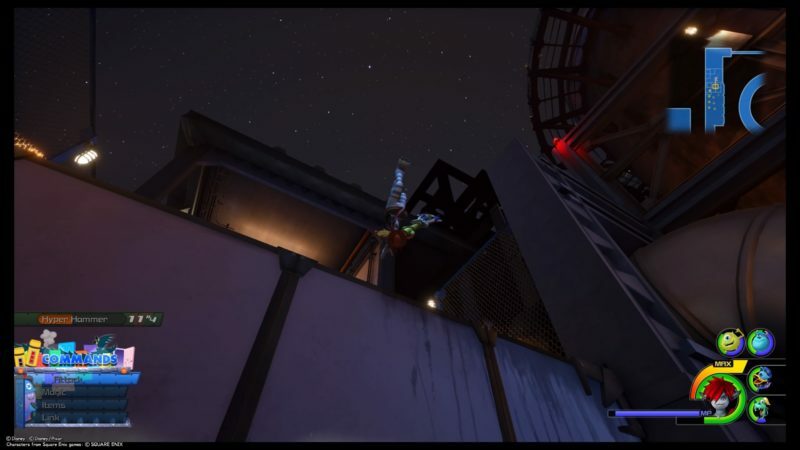 You will finally reach the top of the tank. The only way down is by jumping down. 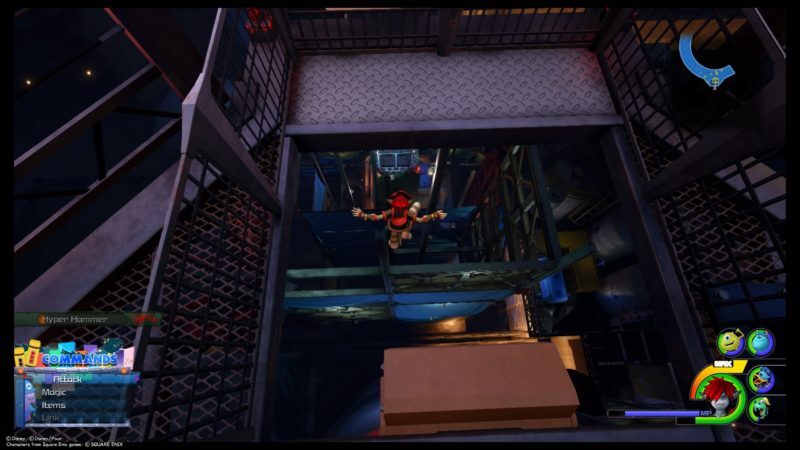 There will be a big box where you land. You need to press “X” to attack it when the prompt shows up. After breaking it, a treasure chest appears. 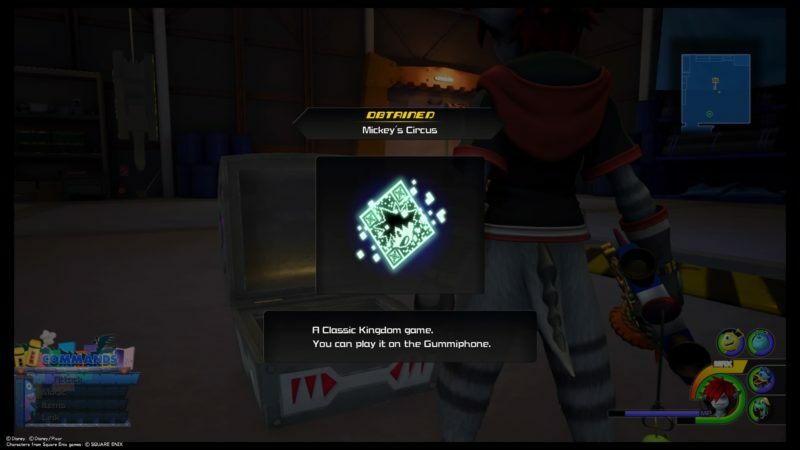 You will get a mini game “Mickey’s Circus” from it. Keep going ahead and you’ll reach another area with flames and a wide open space. 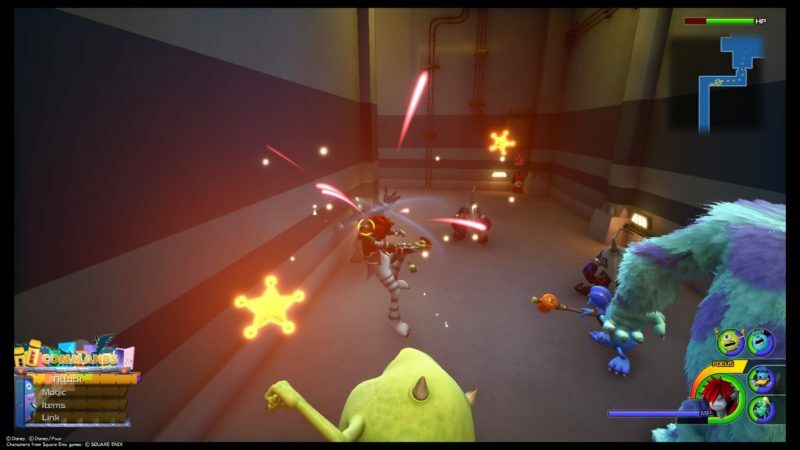 Once again, defeat the enemies and avoid the flames. 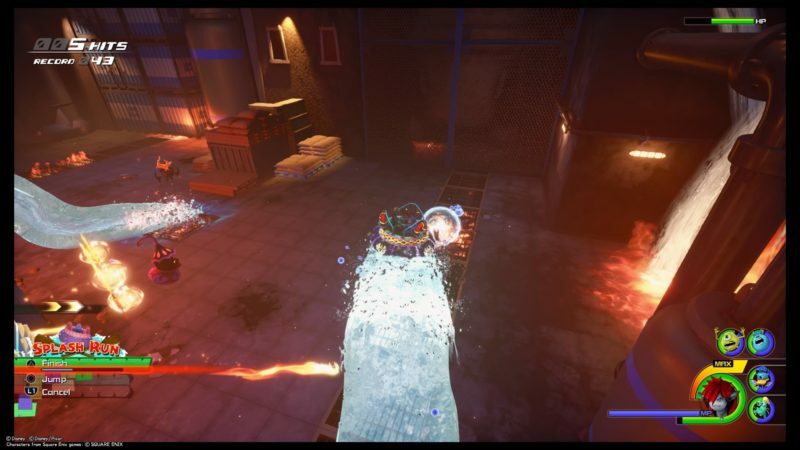 Interestingly enough, if you use this “Splash Run” skill, you can actually take out the flames wherever you go. 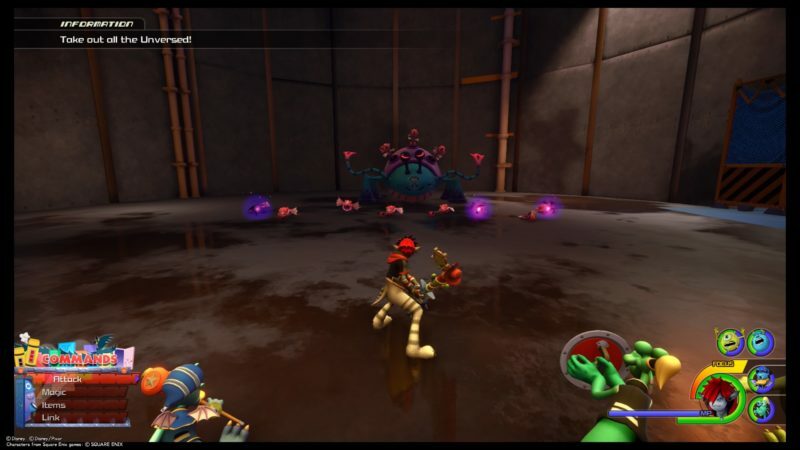 After defeating the enemies, you will earn a Pride Heartbinder which is pretty useful. 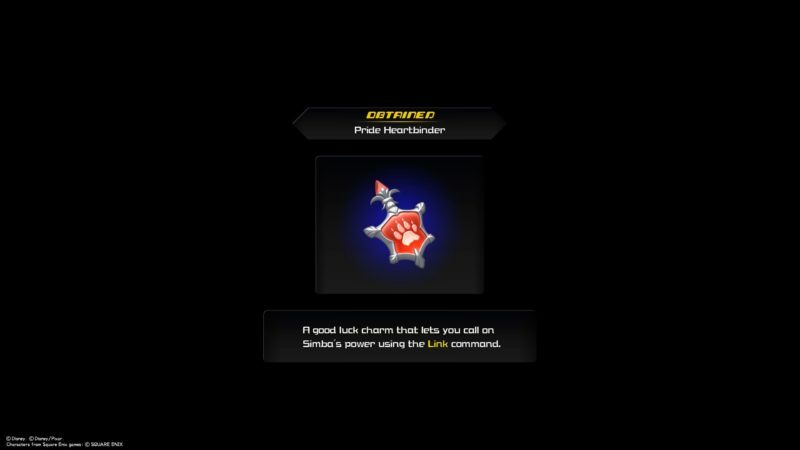 It enables you to use Simba’s power in the Link command section. 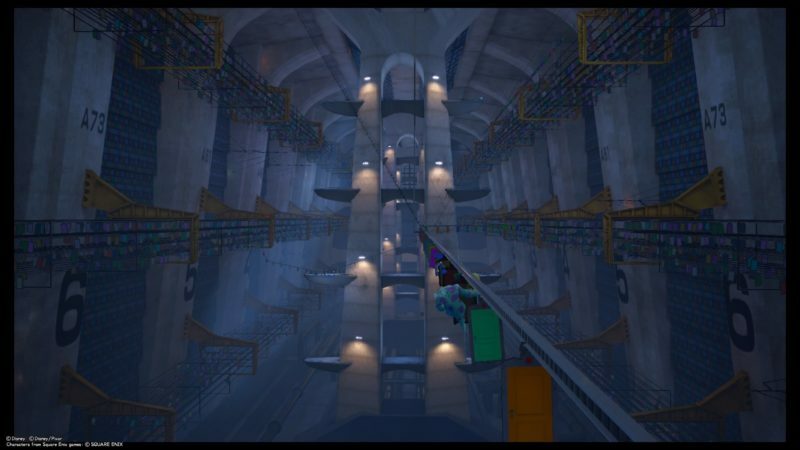 Since the pipes fell and blocked the entrance to the door vault, you have to find an alternative way. Get to the pipe that’s fallen and jump over it. 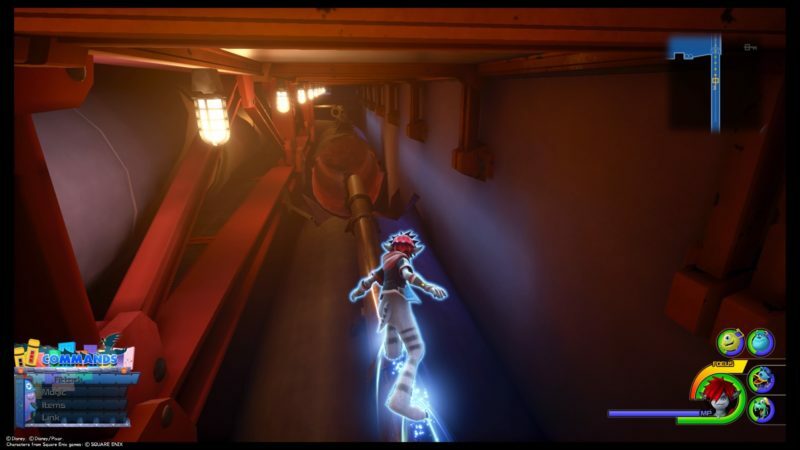 You should find an entrance that allows you to slide through. 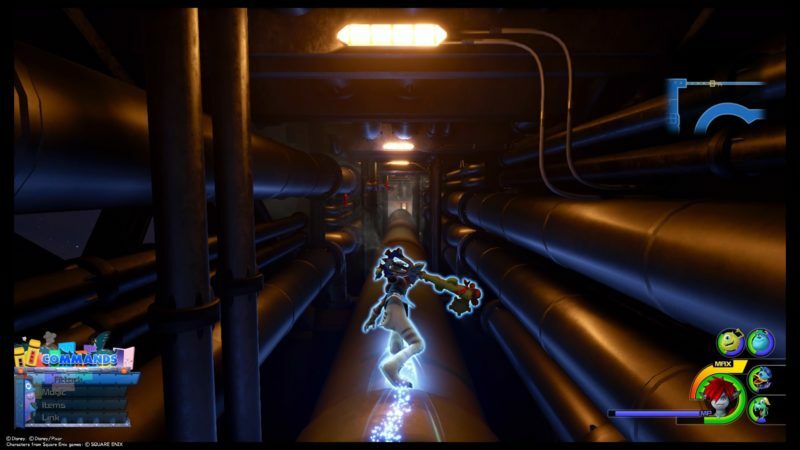 You will then find yourself inside the cooling tank. 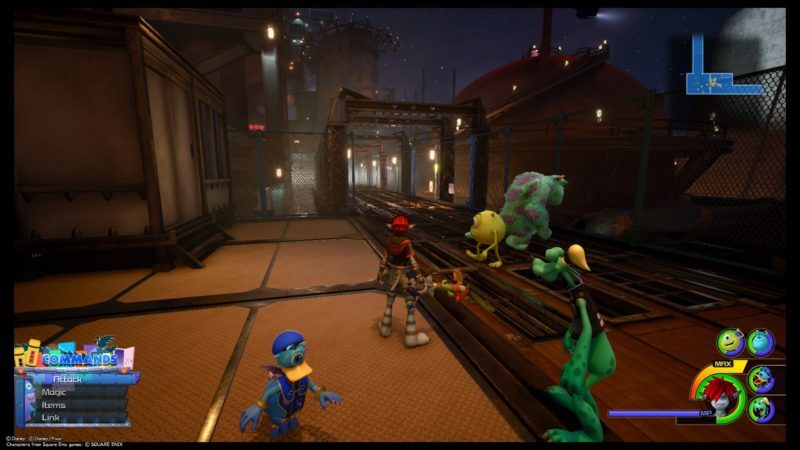 More Unversed will spawn here. Get rid of them first. 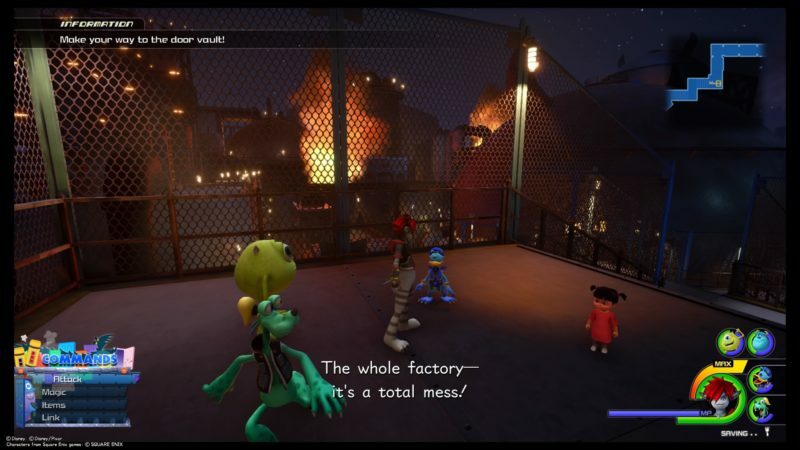 After you’re done, a cutscene loads. 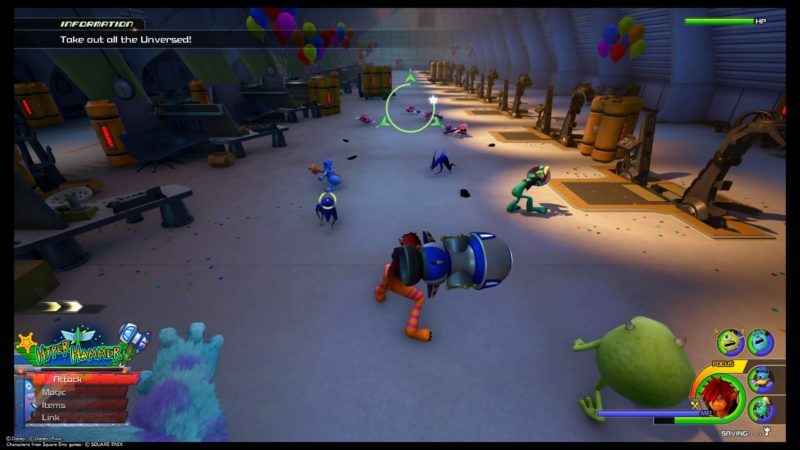 Sulley manages to find an alternative way to the vault. 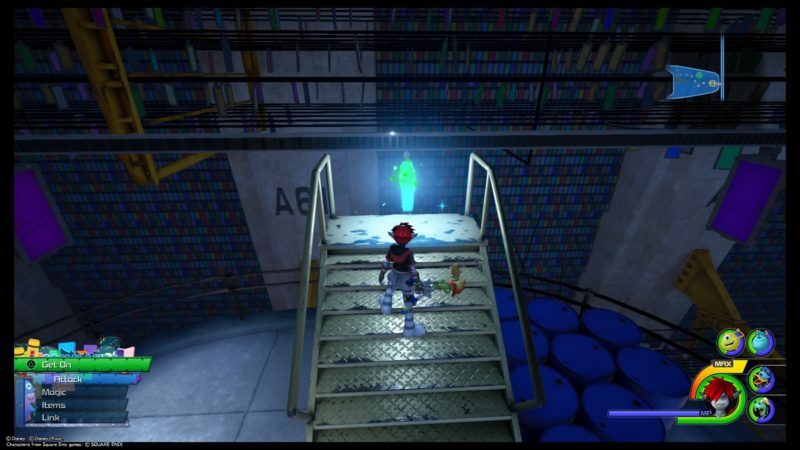 You will find yourself at the Vault Passage. Keep going ahead and defeating the enemies on the way. 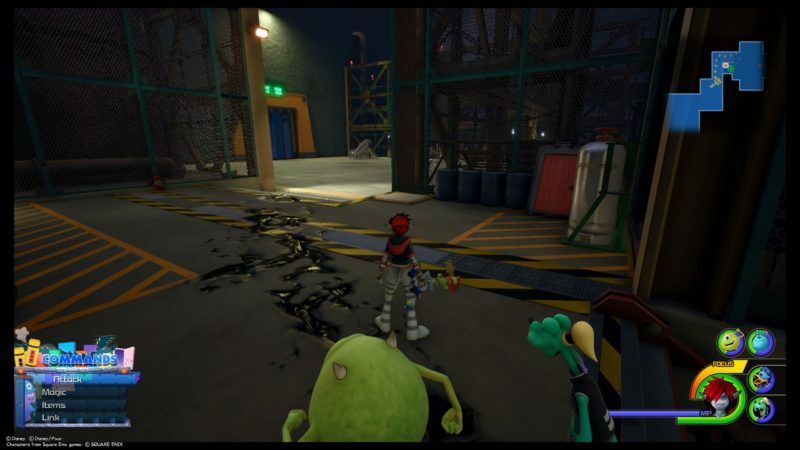 At one point, you should reach a place with some sort of oil / slime spillage on the floor. Follow the trail to the next area. 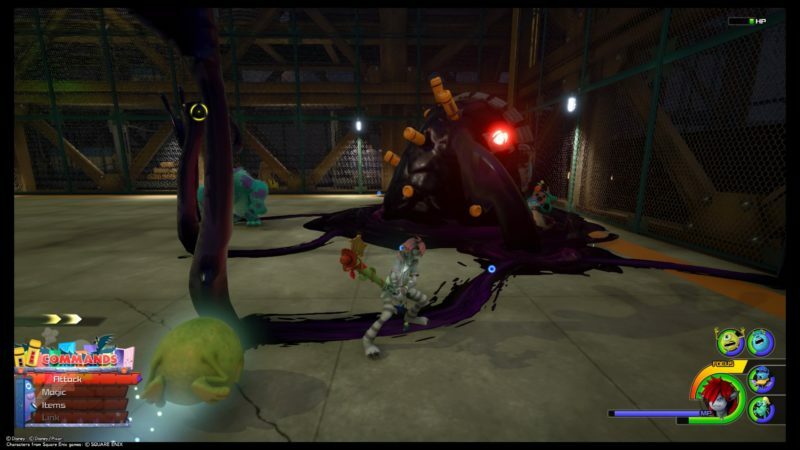 The slime or oil is probably from the final boss. 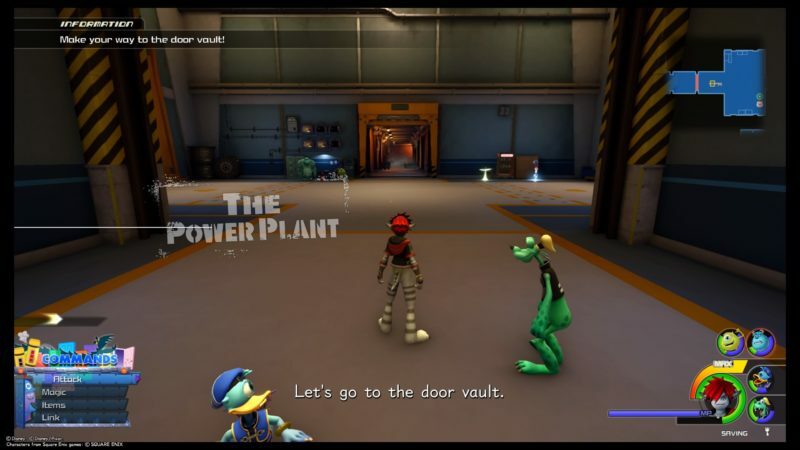 You will now reach the Door Vault. You can save the game first. Once you’re ready, continue going ahead. 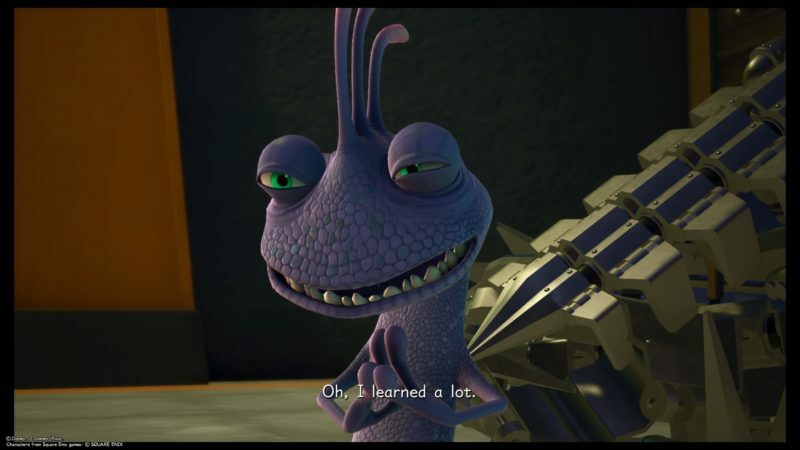 Once again, Randall appears, and this time with his secret weapon. 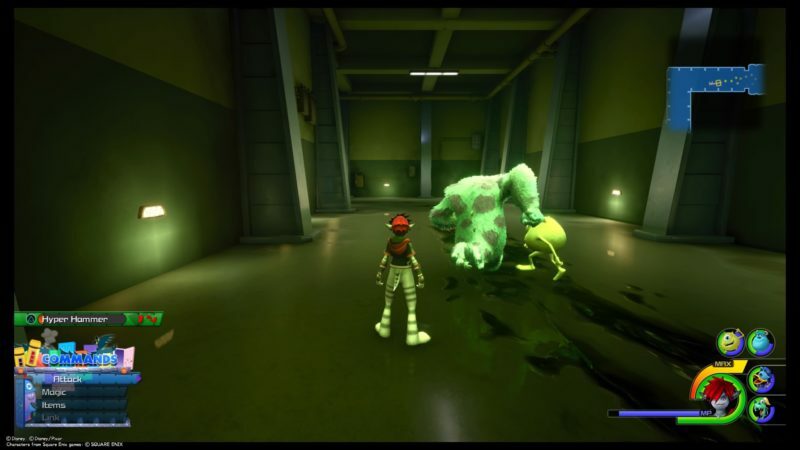 You will now face this giant Unversed which is sort of a big slime monster. 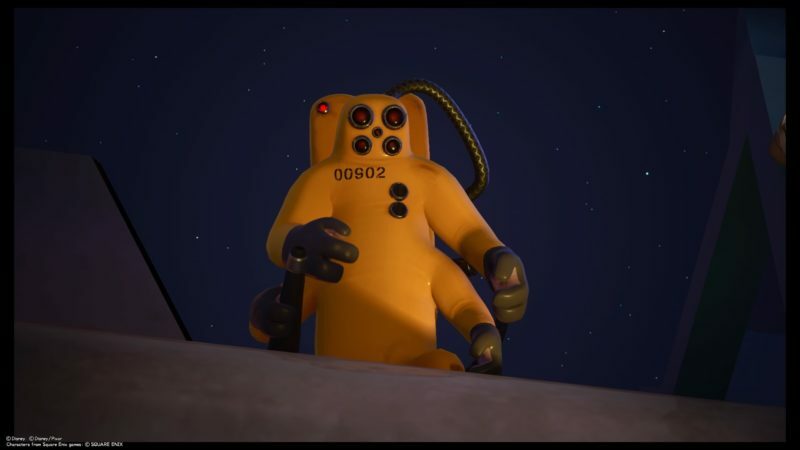 It’s also the final boss of this world. It has about 9 health bars in total. 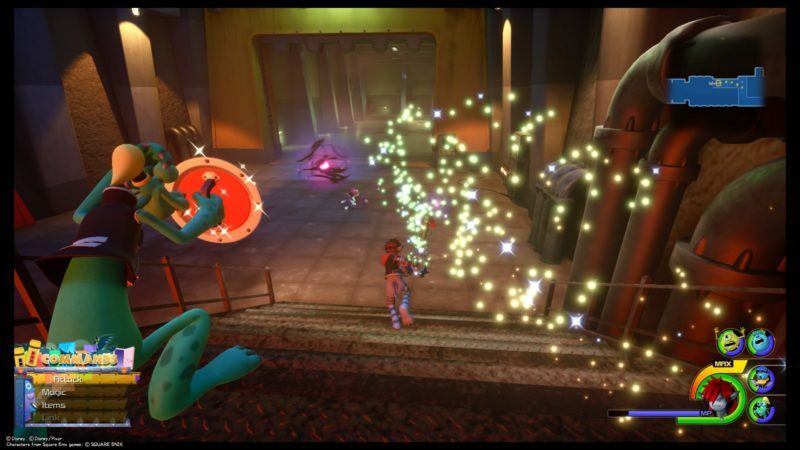 Most of the time, you can hit the boss right in front of his face. However, it may change its appearance into many arms. 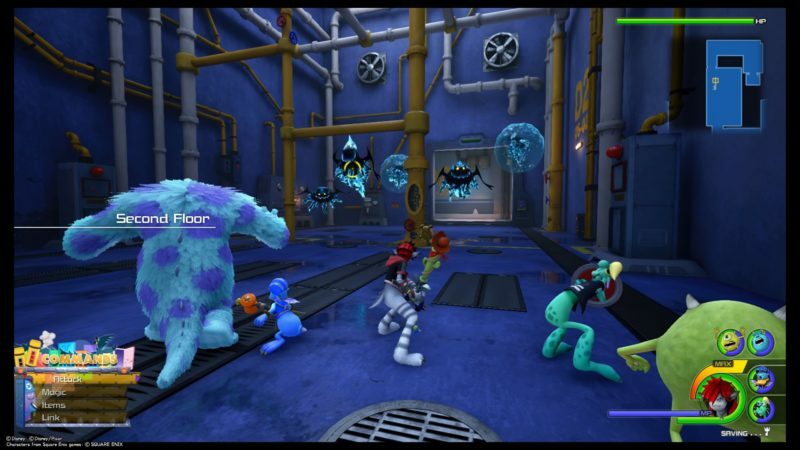 If it changes into arms all around the room, you can only target one of the arms. You should see the yellow target marker like you normally do. 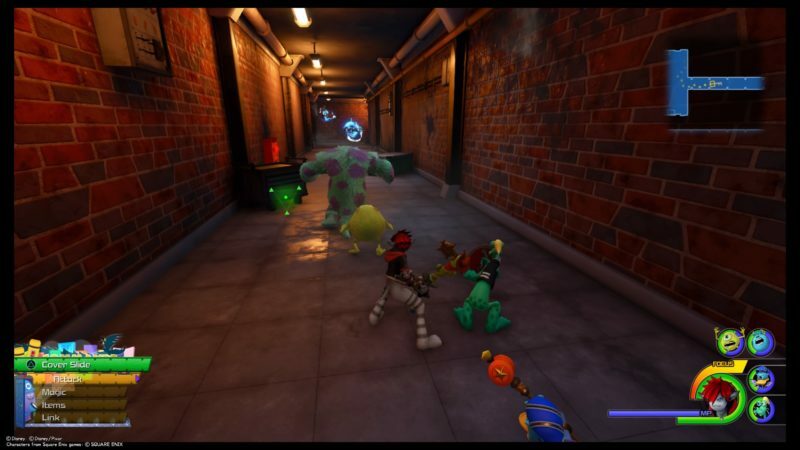 The trick to winning this boss fight is the Link command. 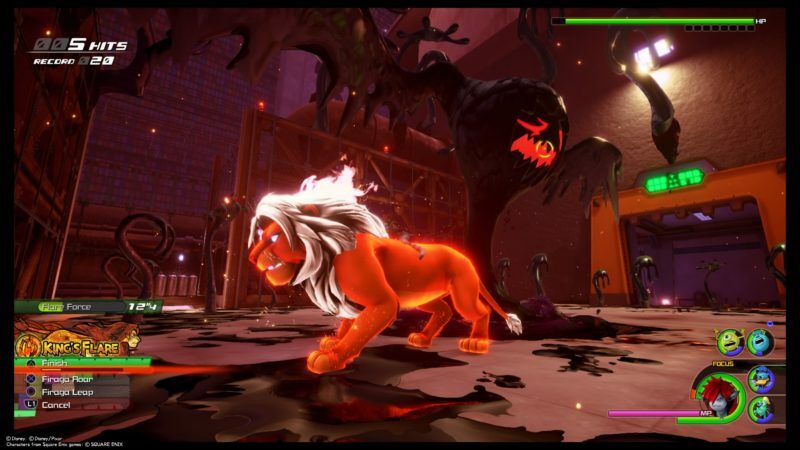 I used Simba’s power twice and it was really good for this boss fight. 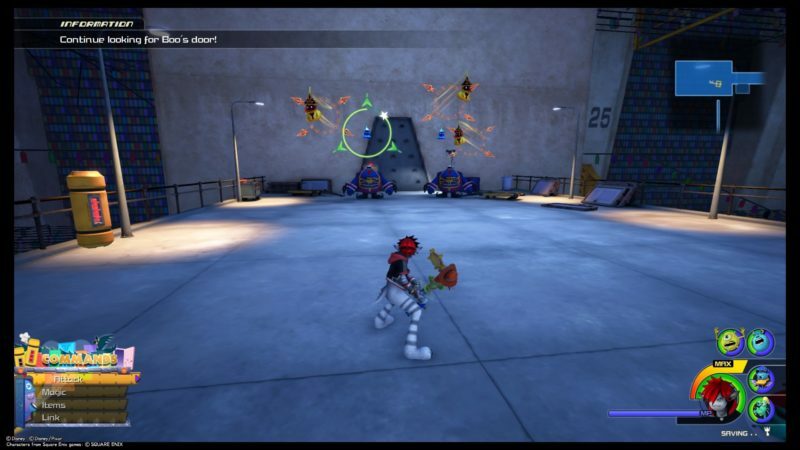 Simba can use Firaga Roar and Firaga Leap which deals good damage. I also used the Meow Wow Balloon and just kept tornado pouncing him. 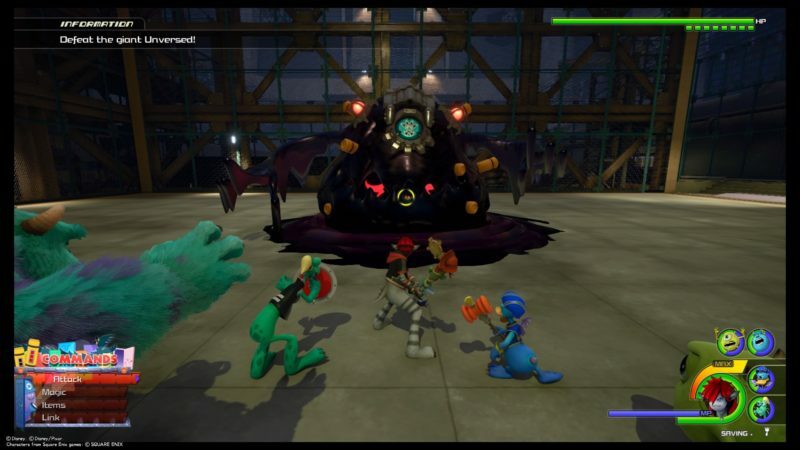 Keep using the Link command and the team attacks, and you’ll get rid of the final boss in no time. 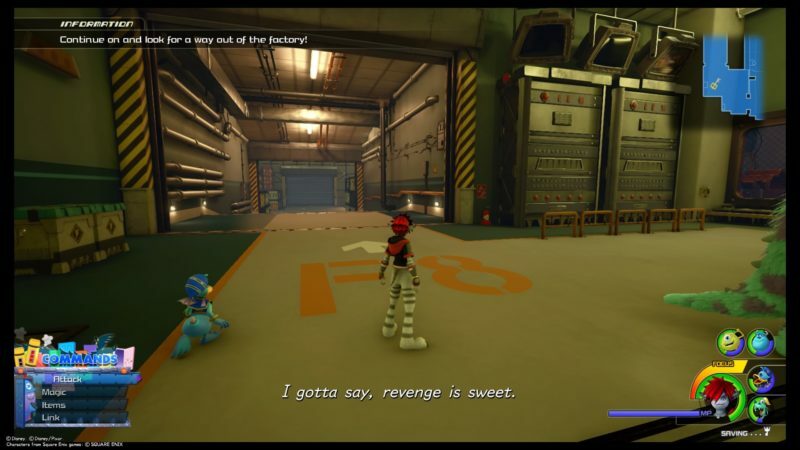 Once the fight is over, a cutscene appears again. 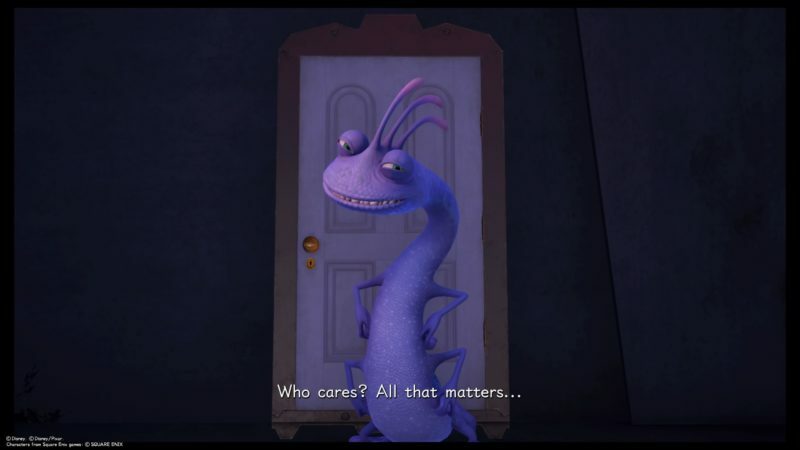 Sulley threw Randall through the door he came from. 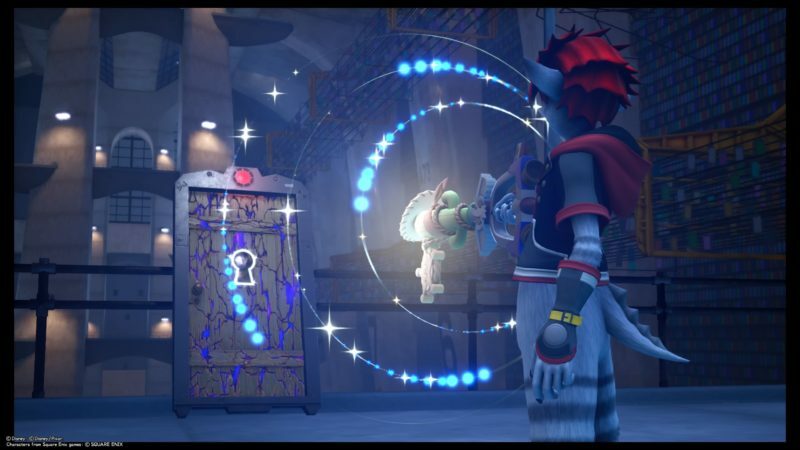 To seal the door, Sora uses his keyblade ability. 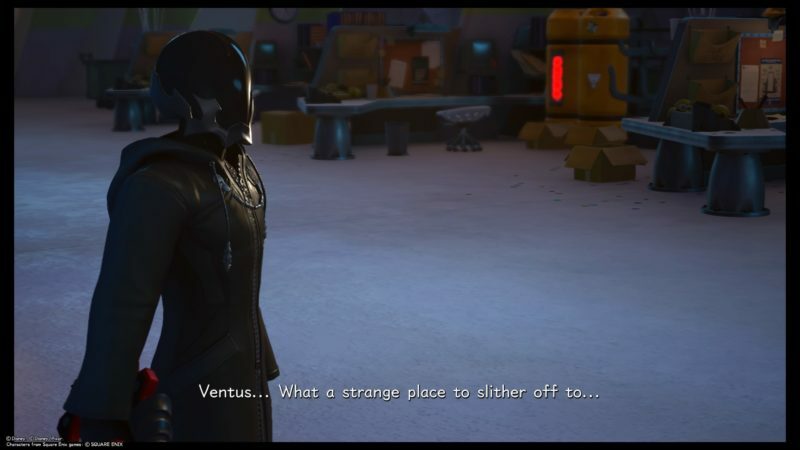 There’s a twist in the ending where Vanitas appears. 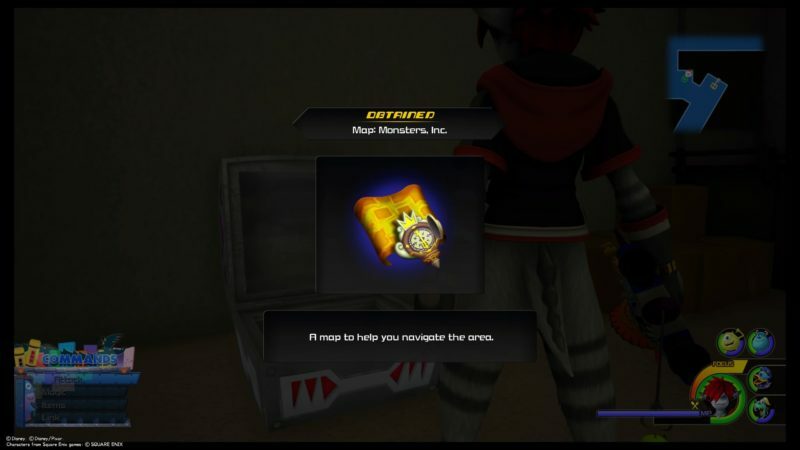 Apparently Ventus’ heart is still inside Sora’s heart, since Sora’s heart possesses three different hearts. 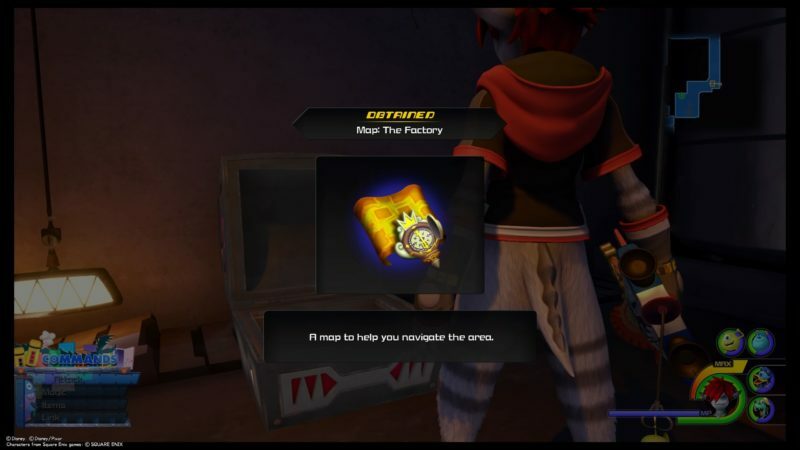 He wants Ventus’ heart back and tries to get it back. 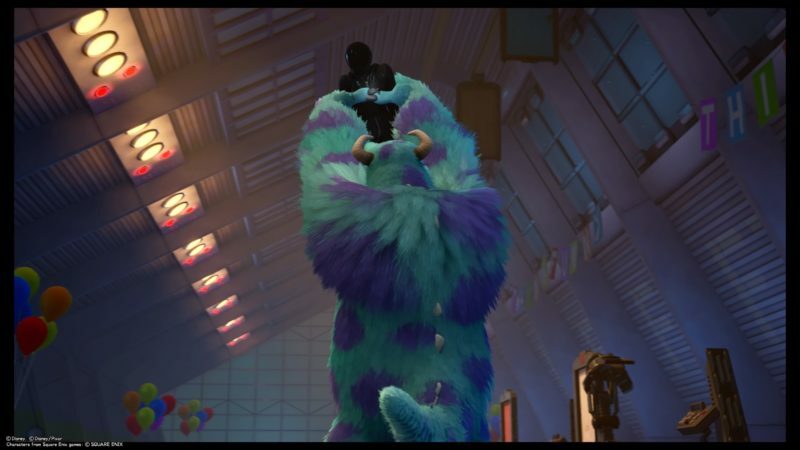 Sulley then grabs Vanitas and throws him into one of the doors. 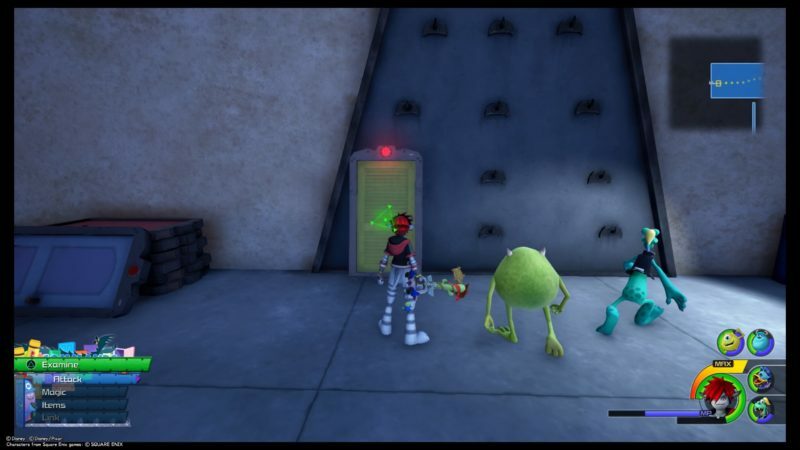 They (with Mike) then kept throwing each door into another door (and so on) to ensure he doesn’t come back. 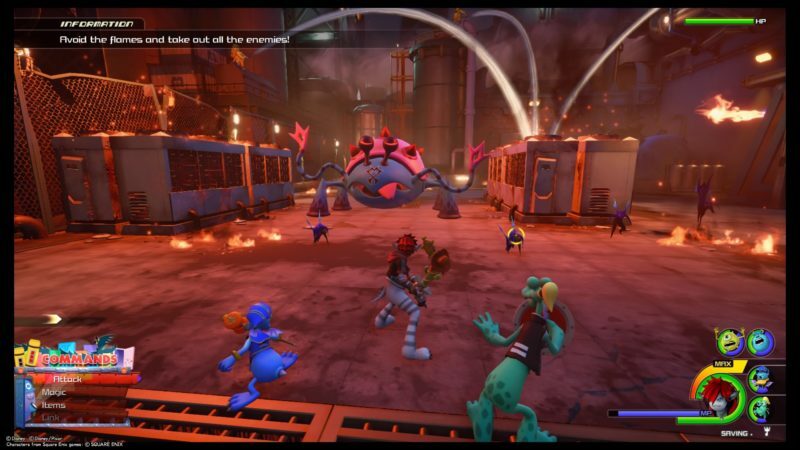 This is the end of Monstropolis in Kingdom Hearts 3. 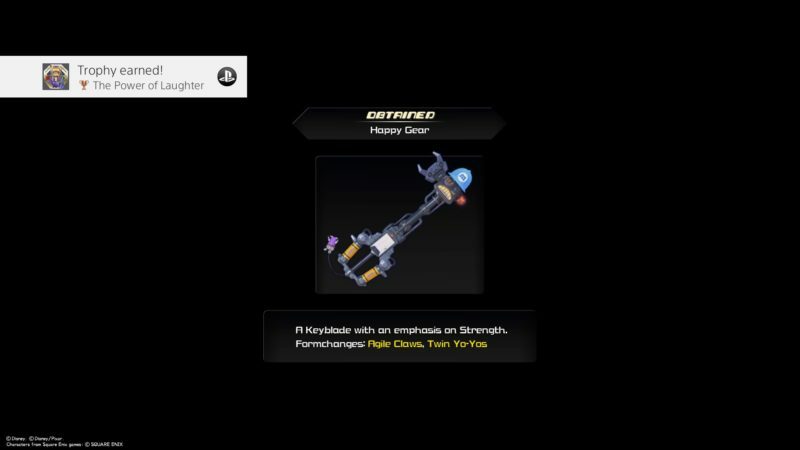 As usual, you will get a keyblade and this one is called Happy Gear. 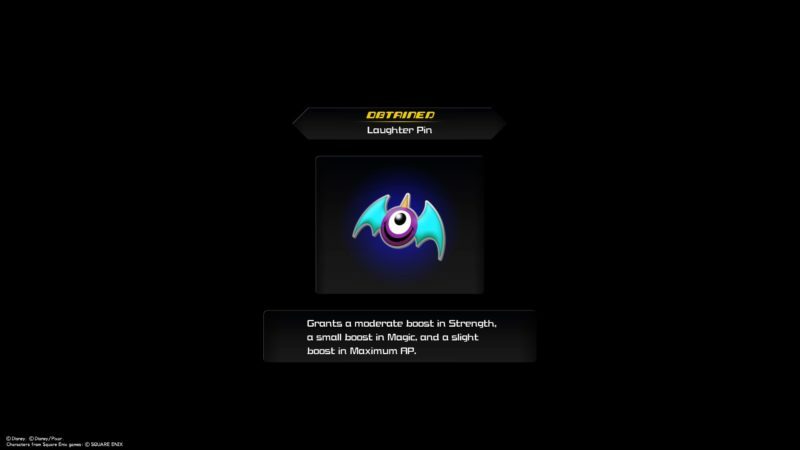 It emphasizes on Strength abilities. 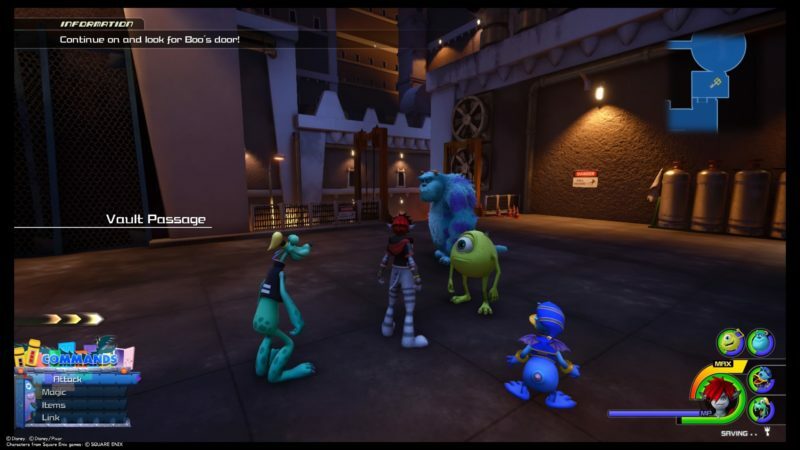 Hopefully this walkthrough and guide of Monstropolis (KH3) is useful for you.